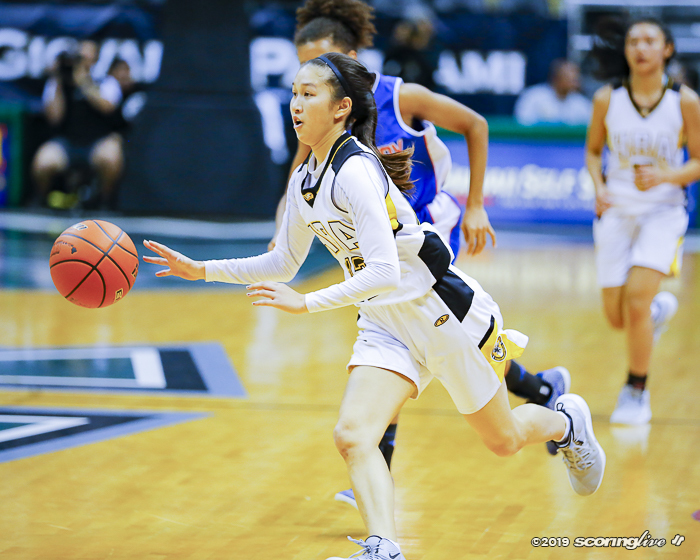 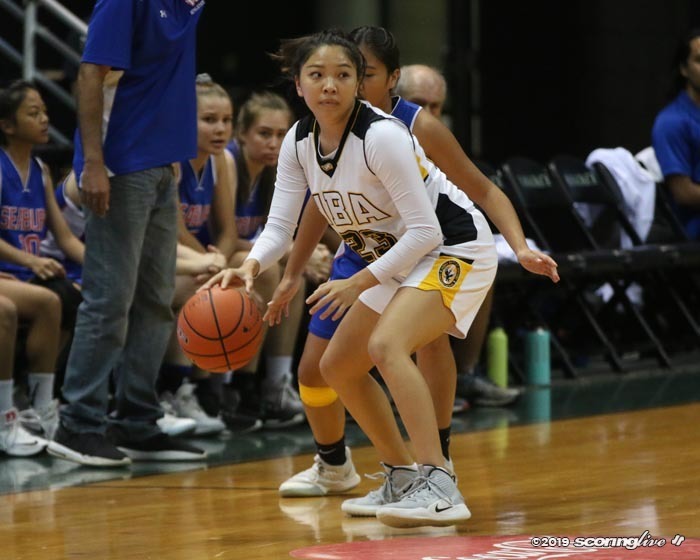 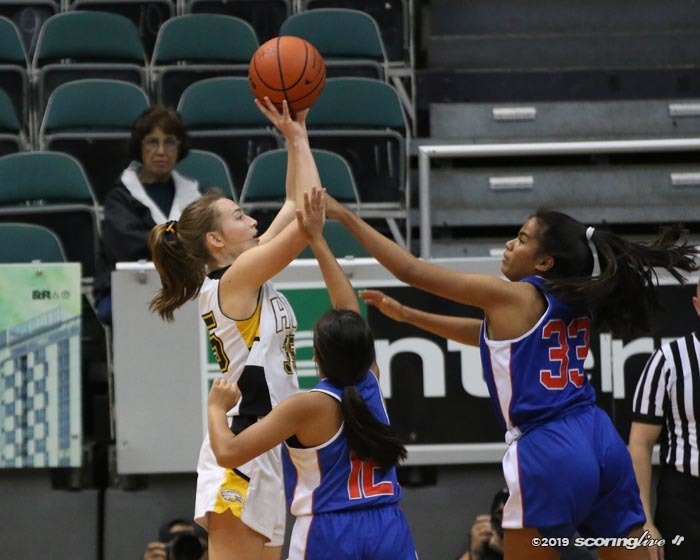 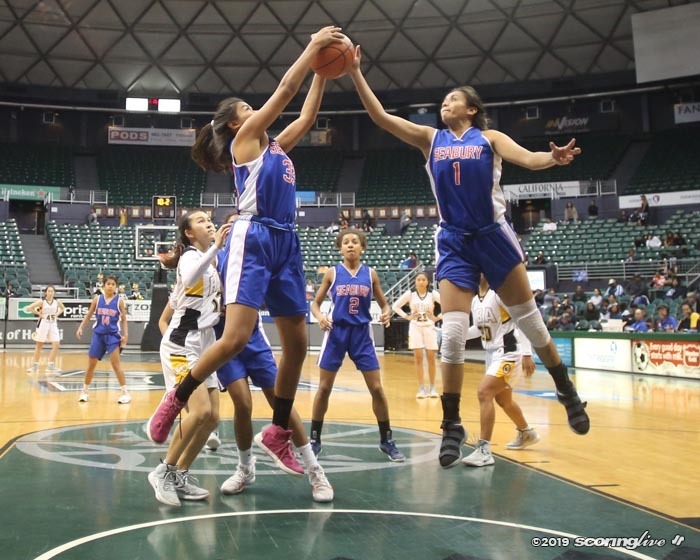 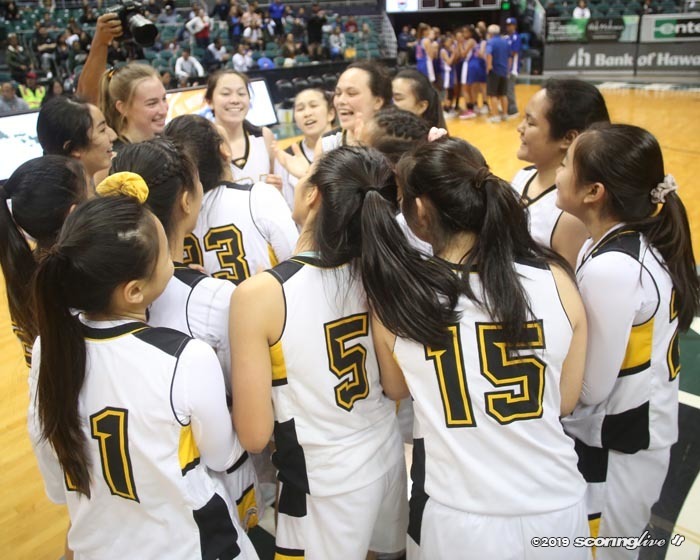 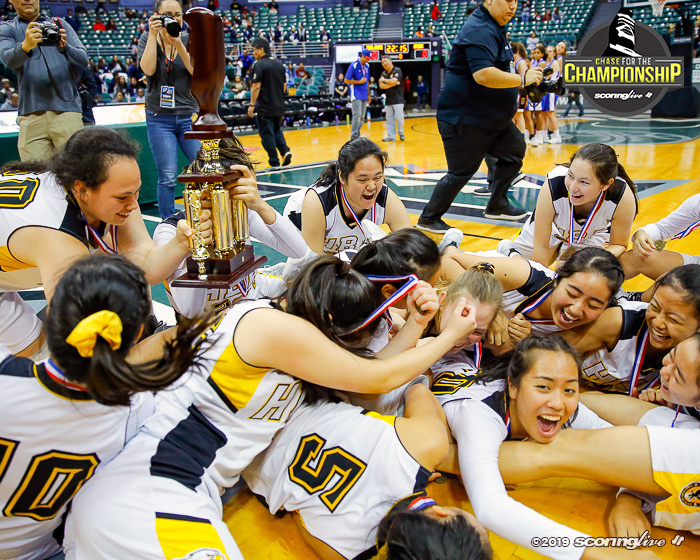 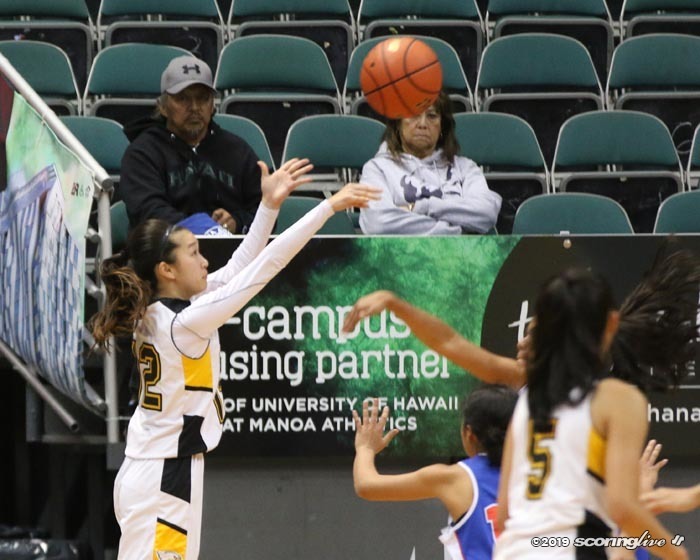 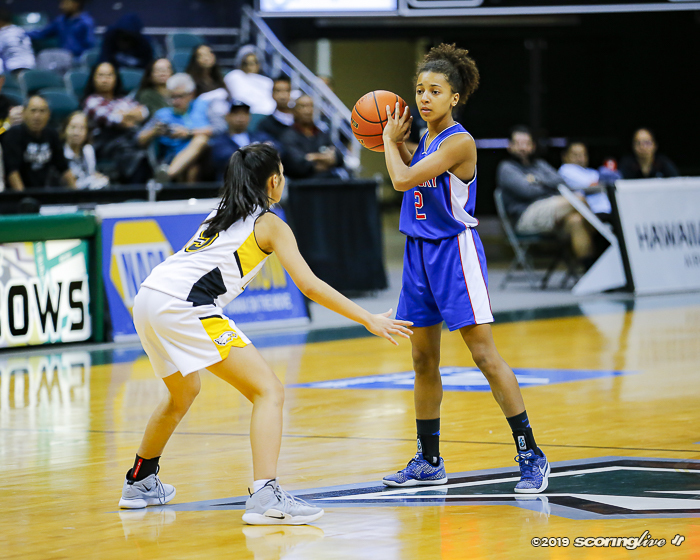 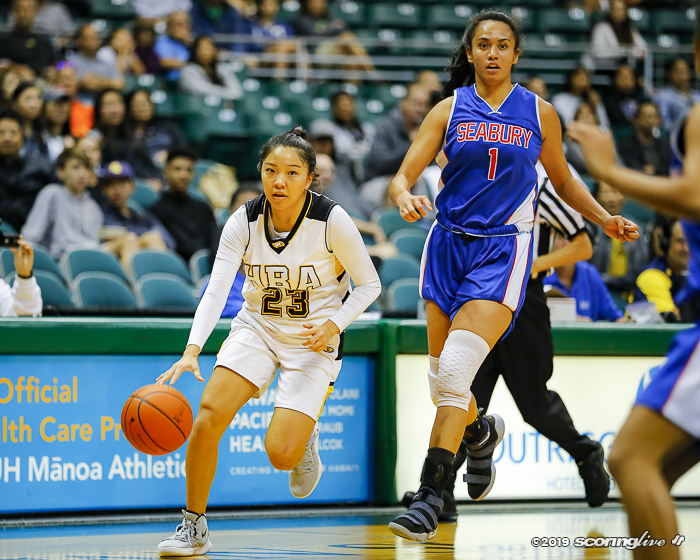 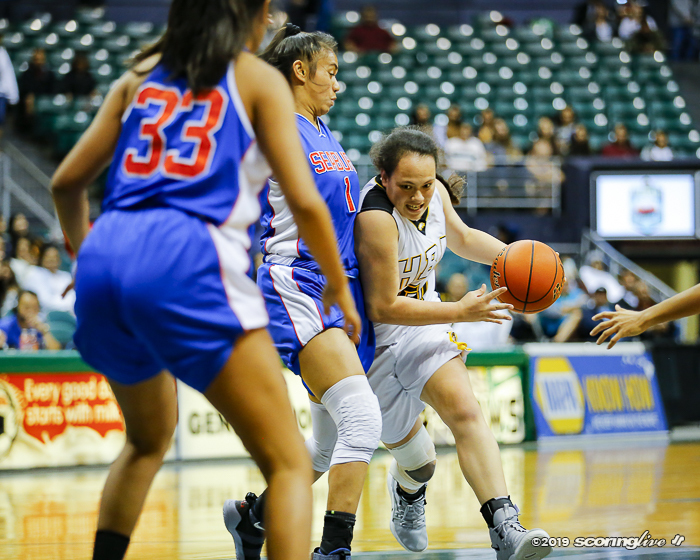 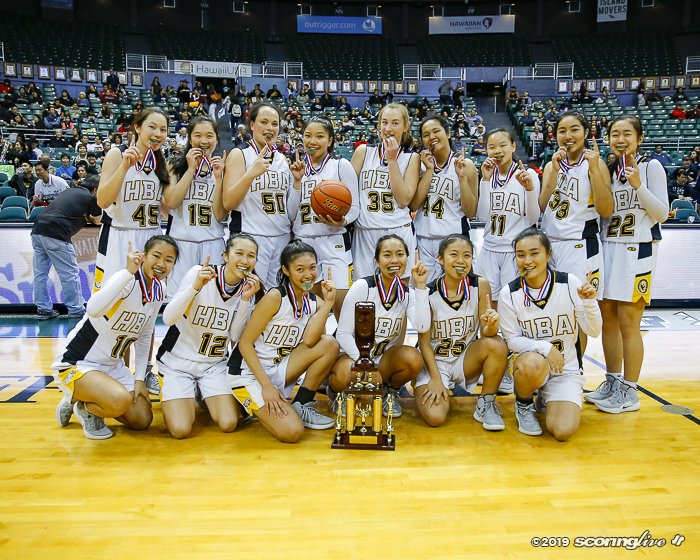 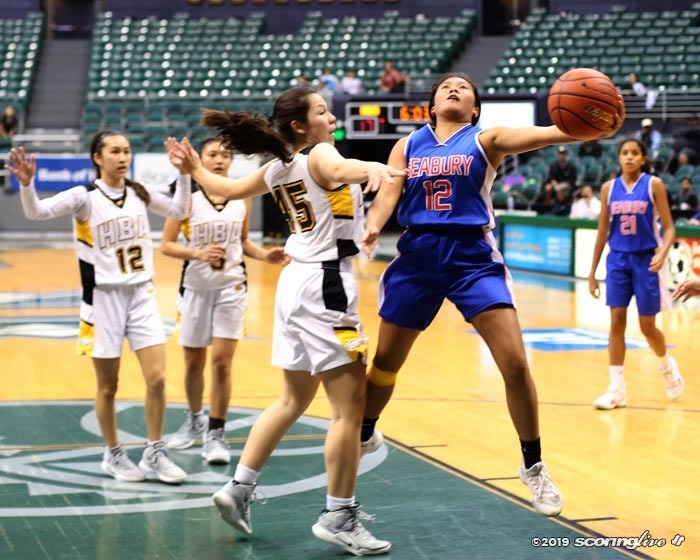 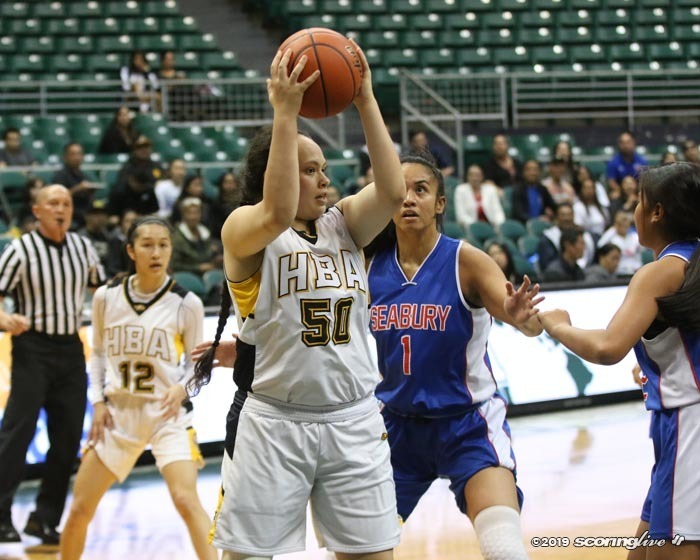 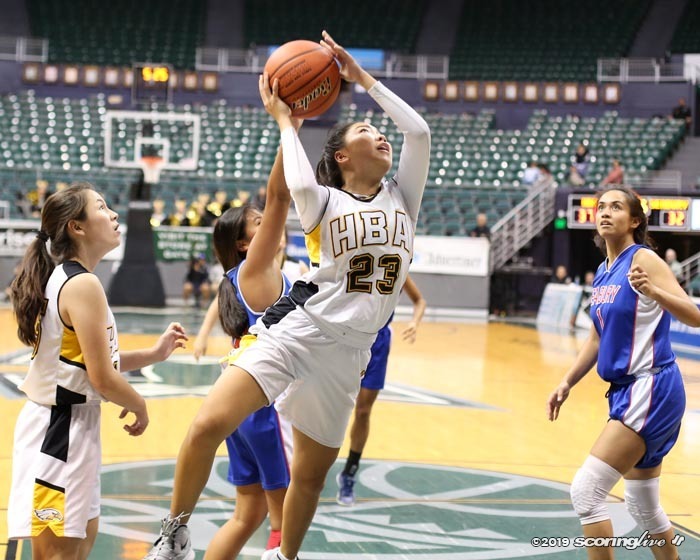 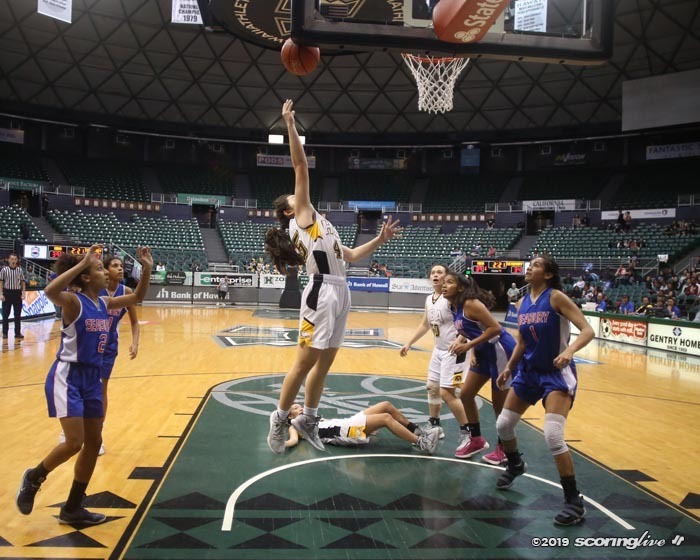 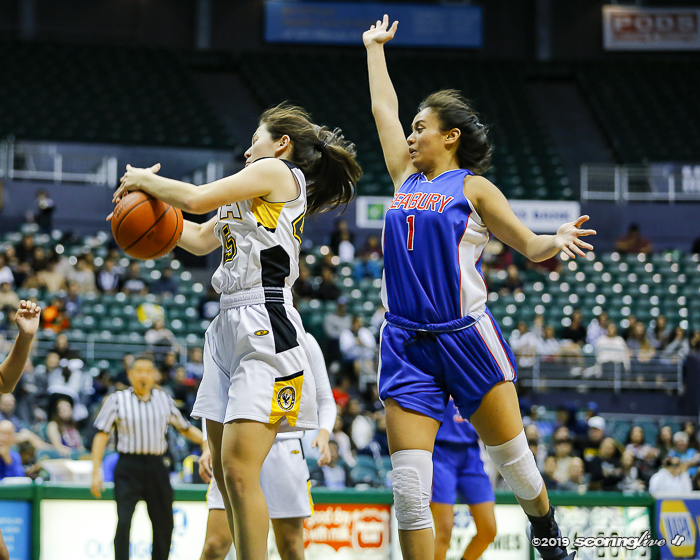 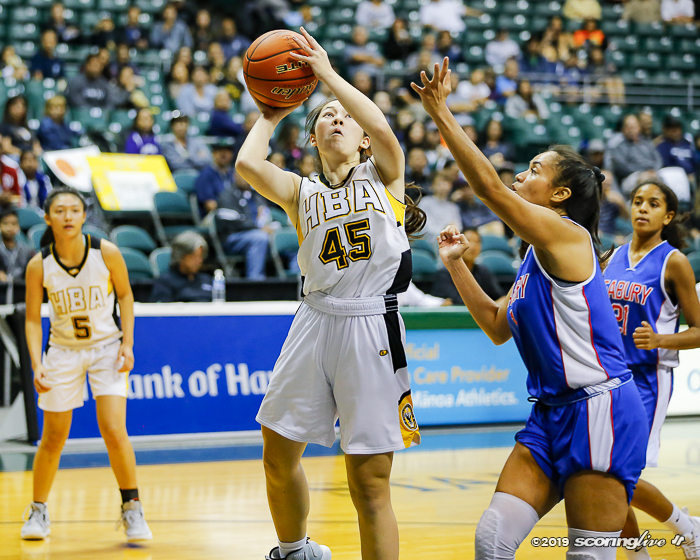 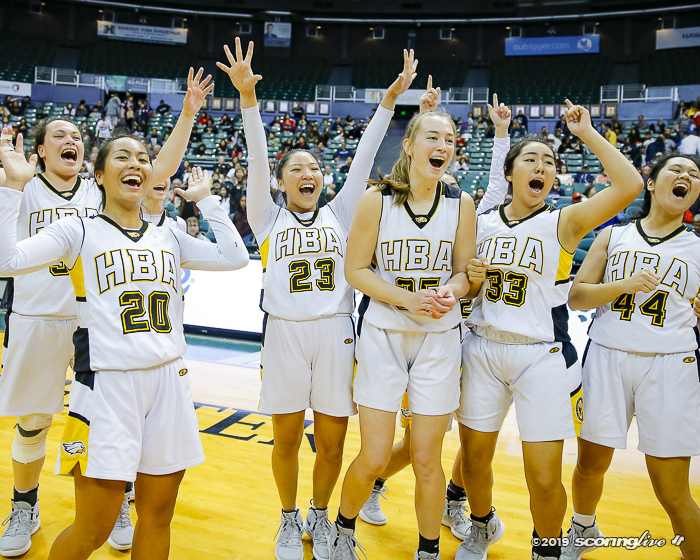 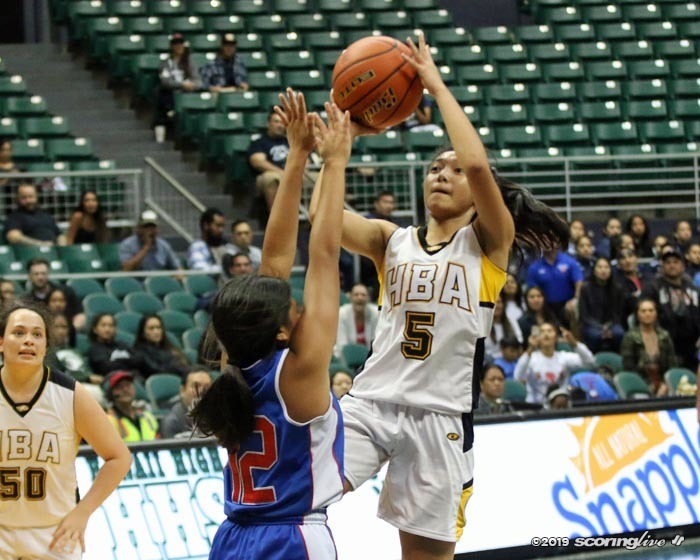 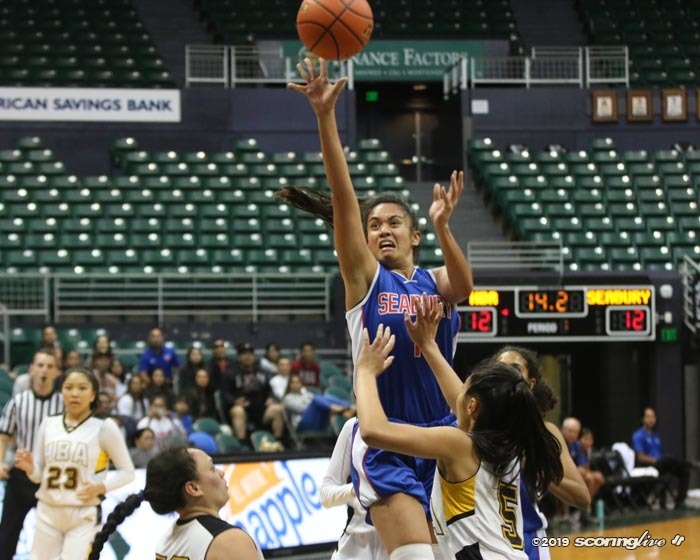 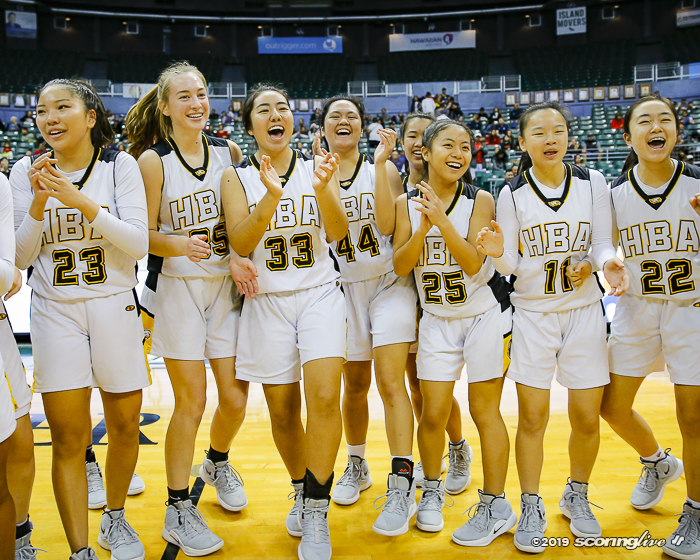 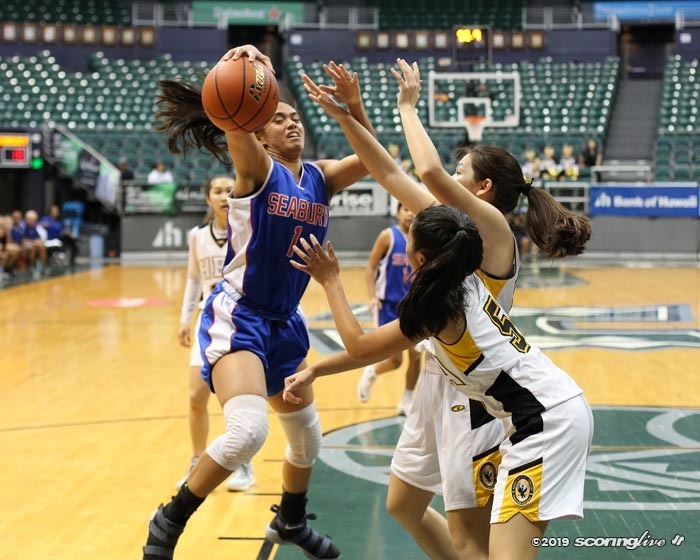 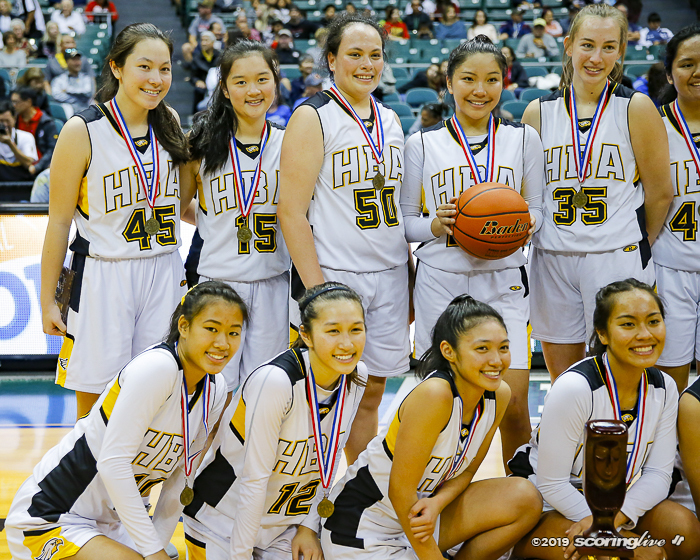 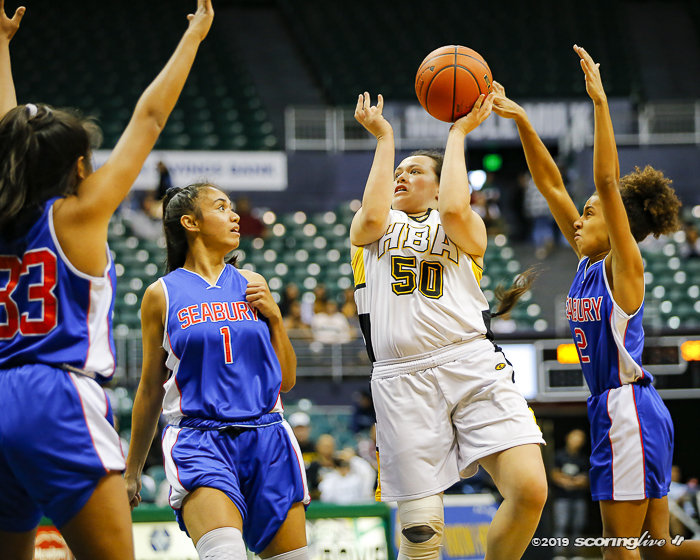 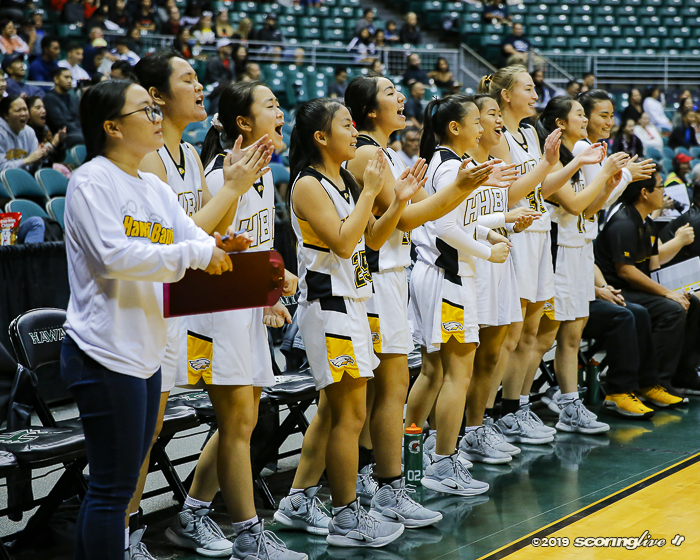 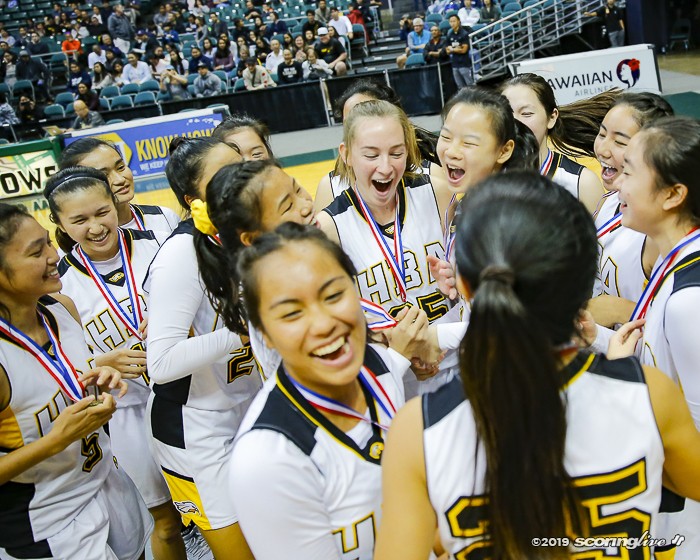 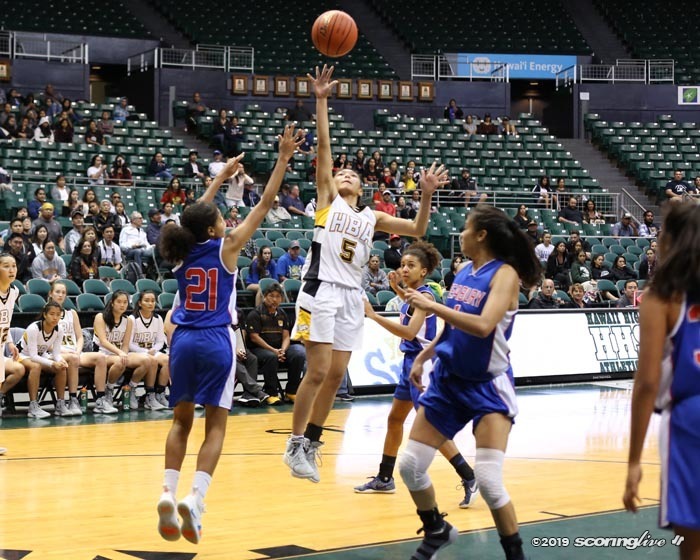 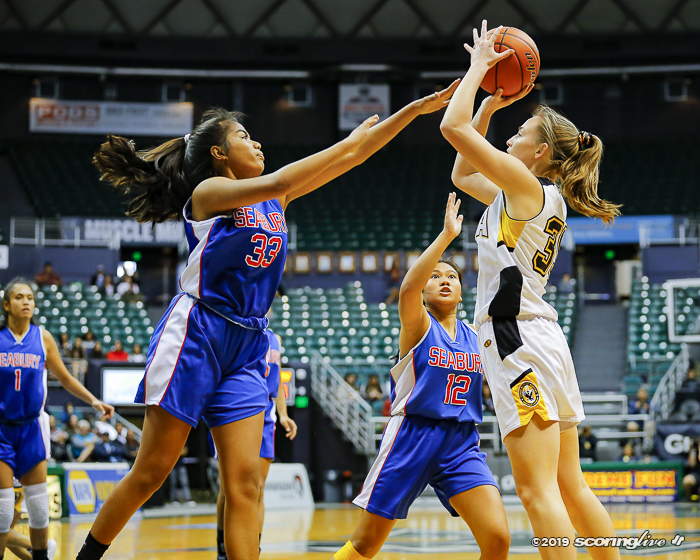 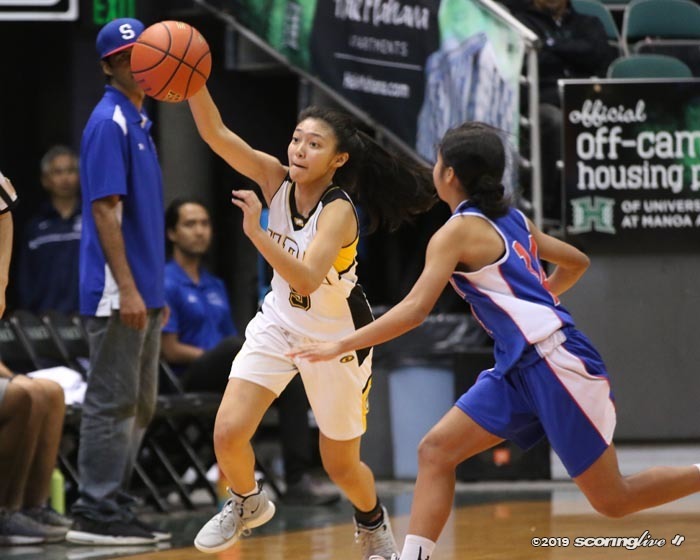 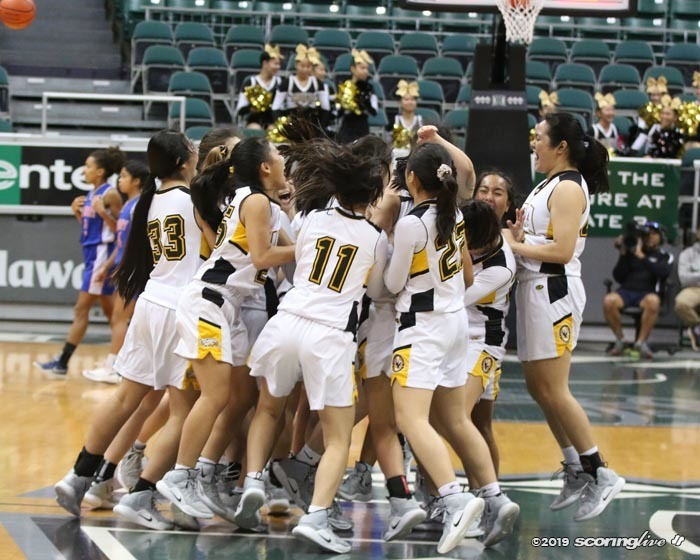 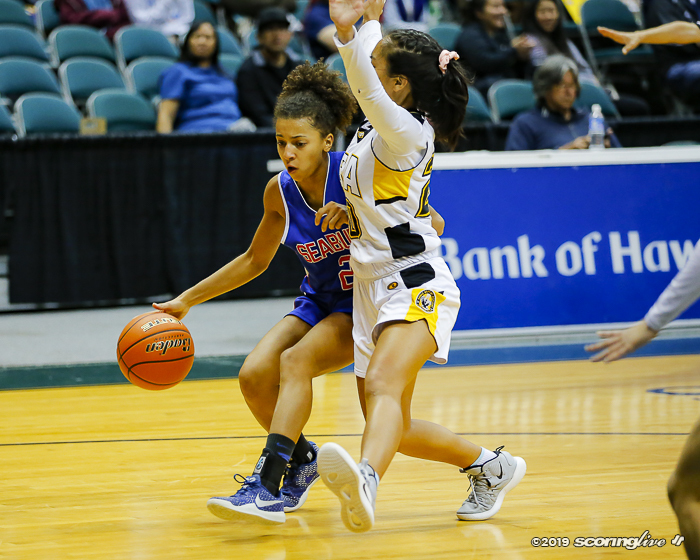 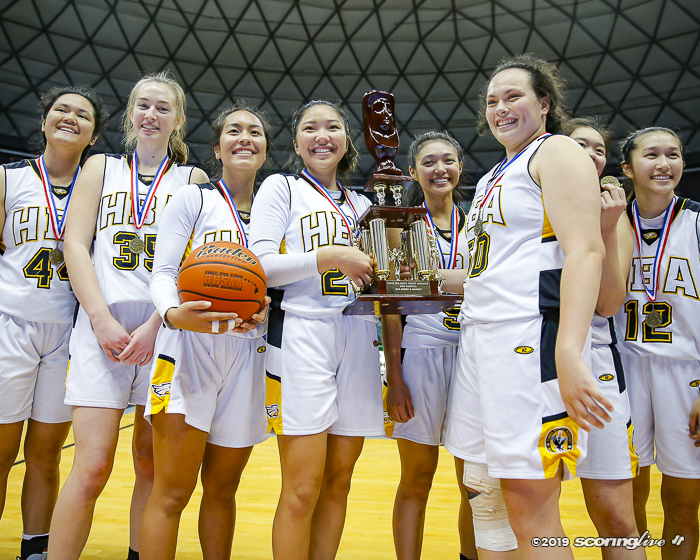 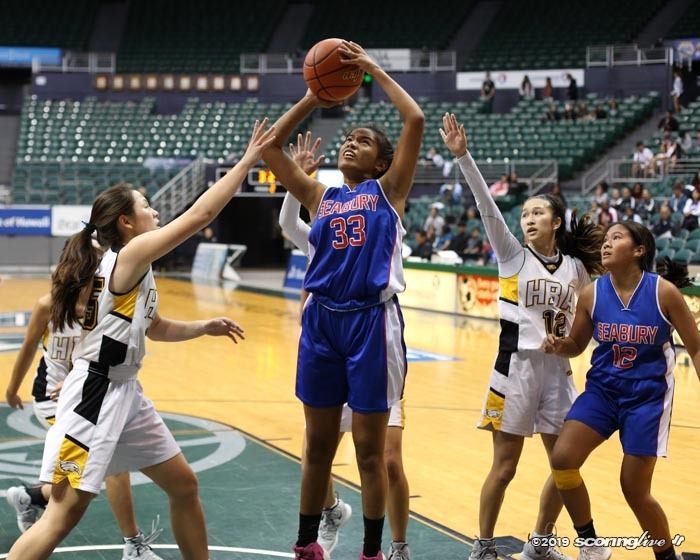 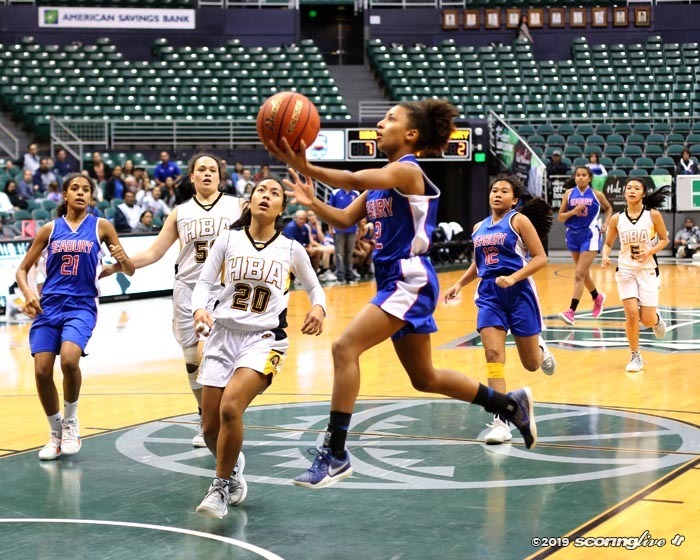 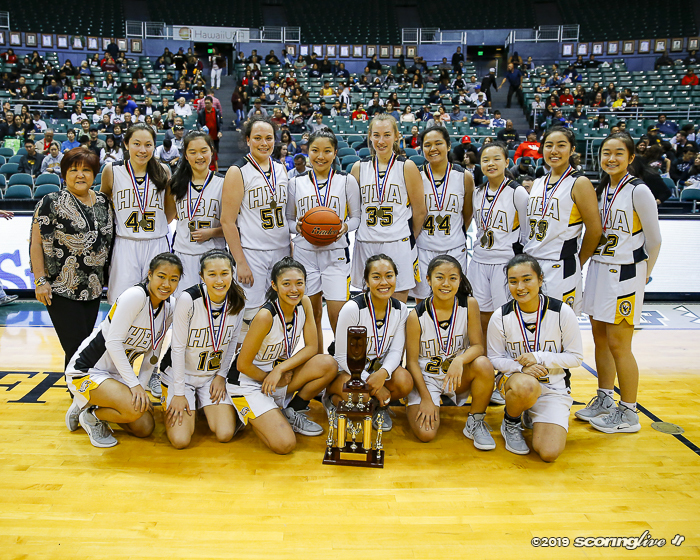 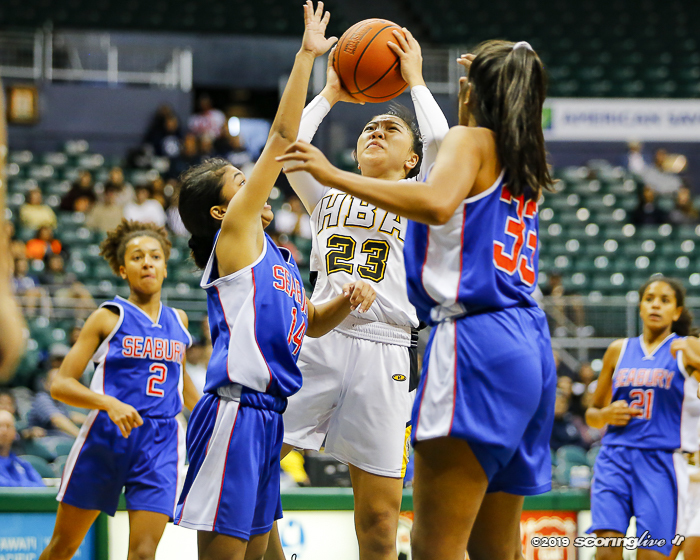 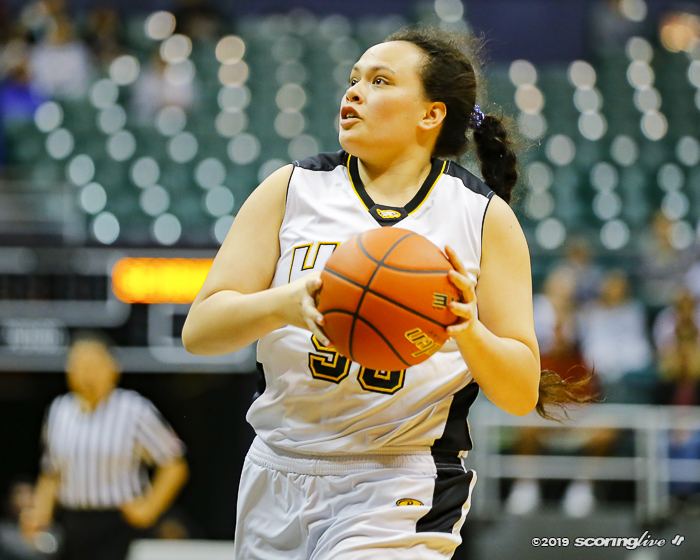 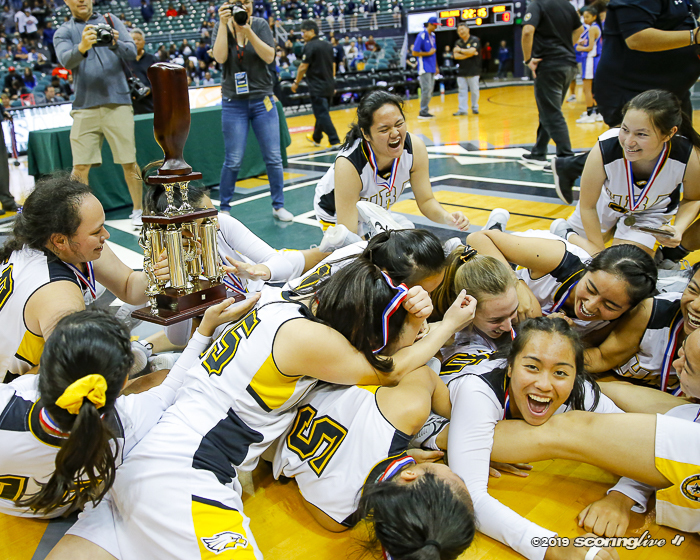 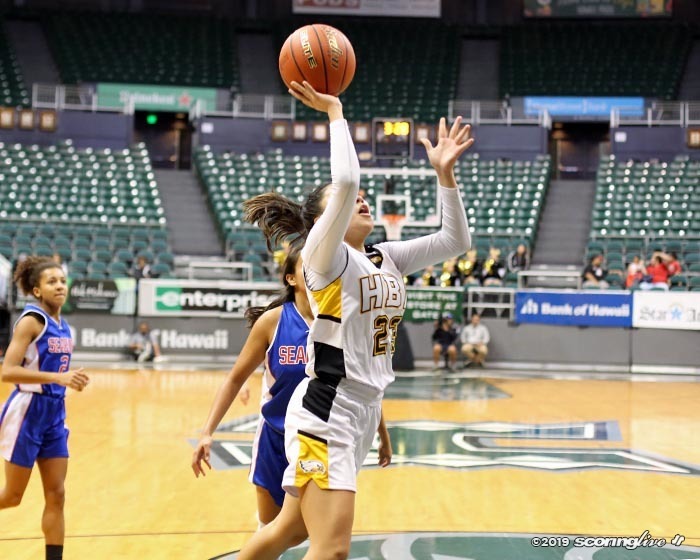 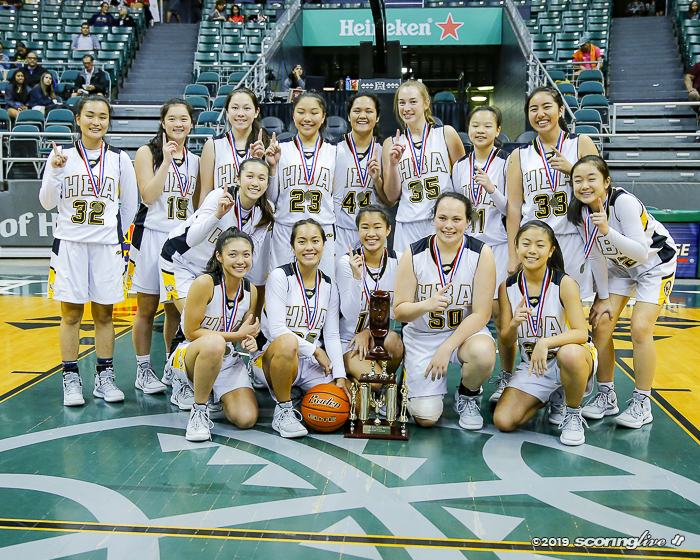 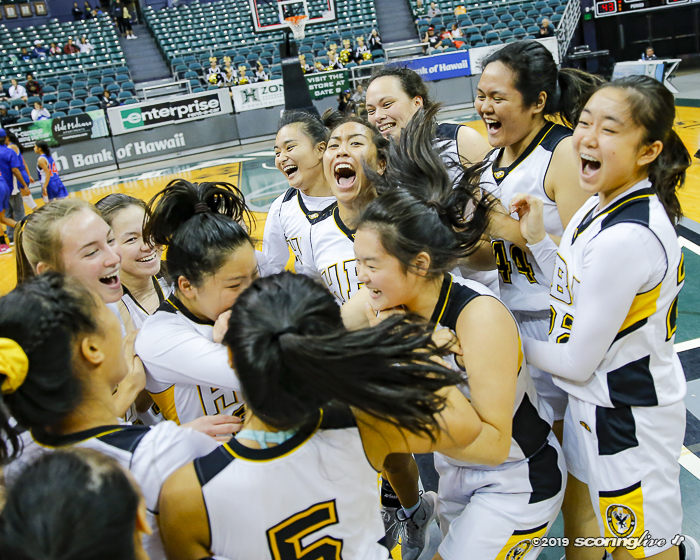 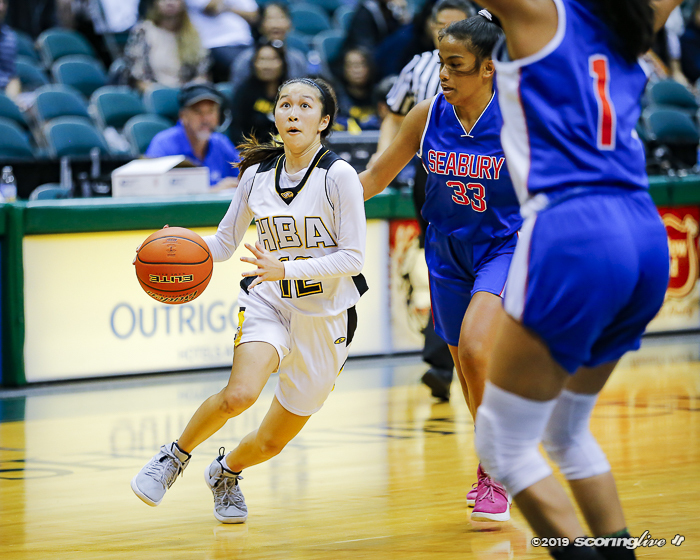 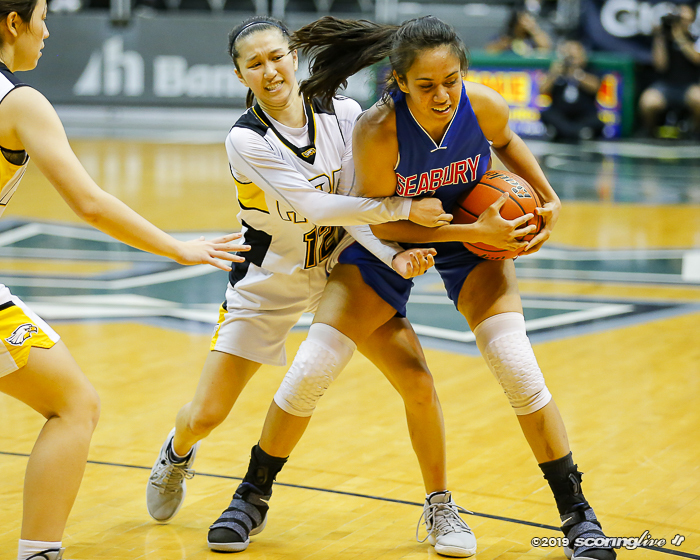 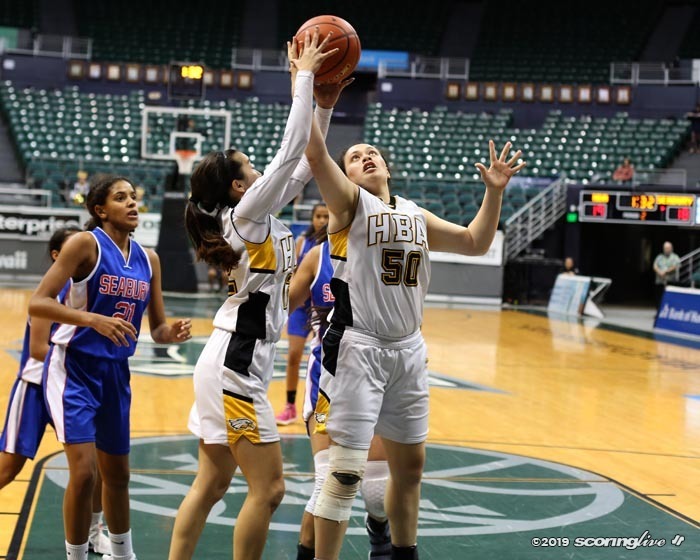 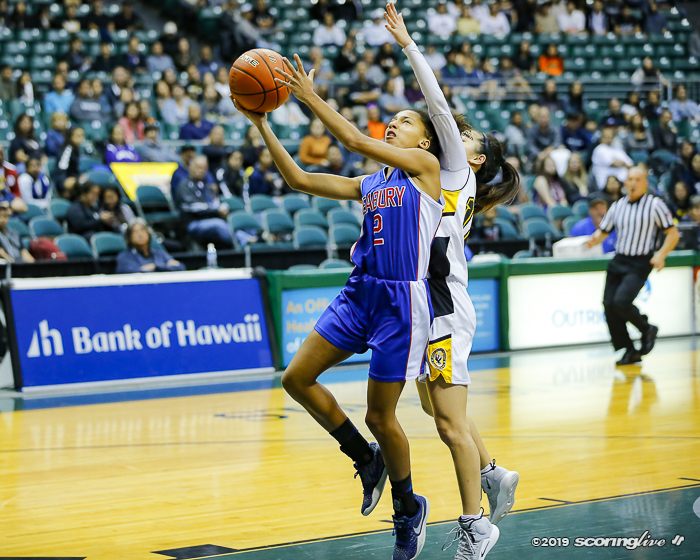 MANOA — Top seed Hawaii Baptist Academy held off second seed Seabury Hall, 43-39, to win its second Snapple/HHSAA Division II Girls Basketball State Championship since 2016 at the Stan Sheriff Center Saturday. 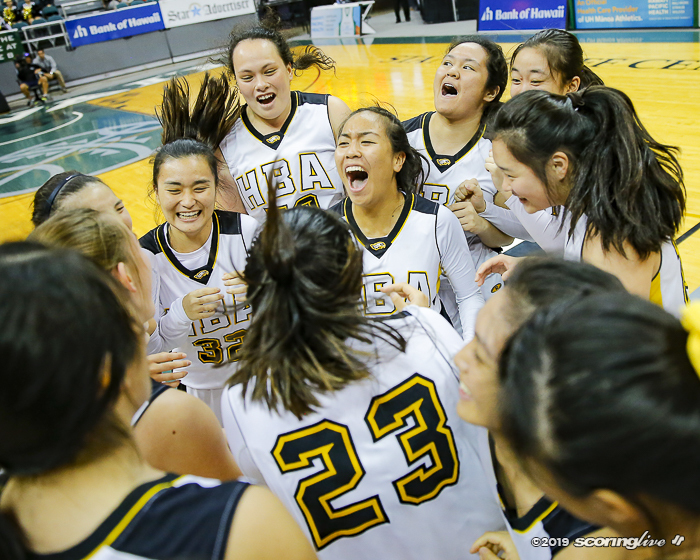 The Eagles last loss came against a Mainland opponent on Dec. 26 but the team won the next 13 games en route to their second overall title. "It feels really good. 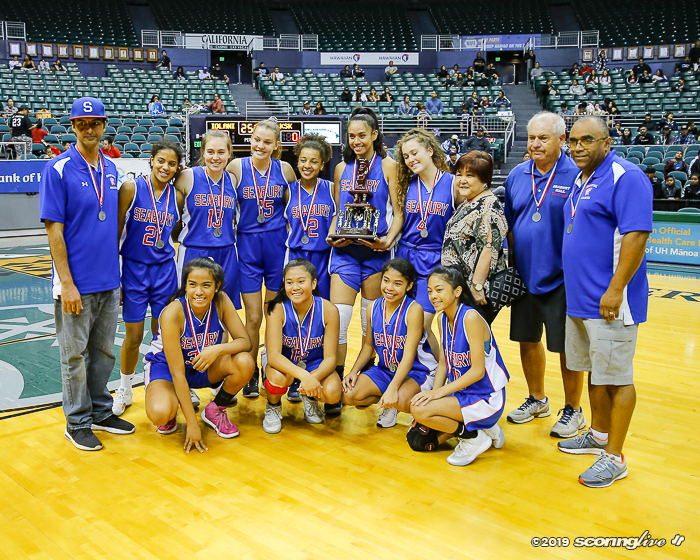 I'm so proud of our team. 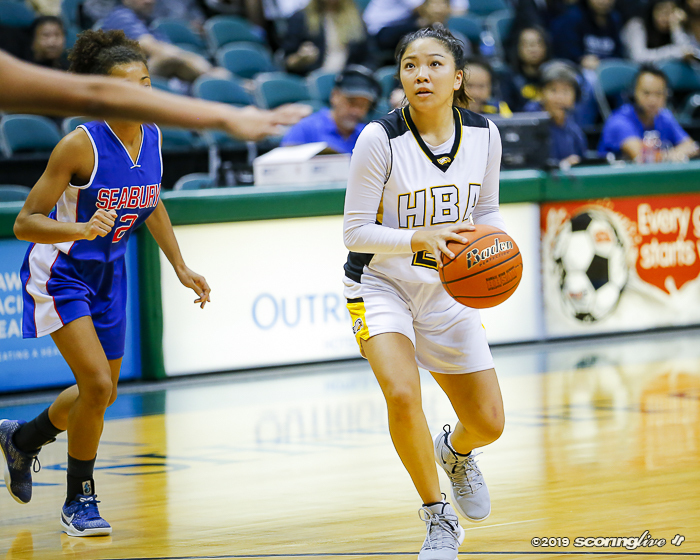 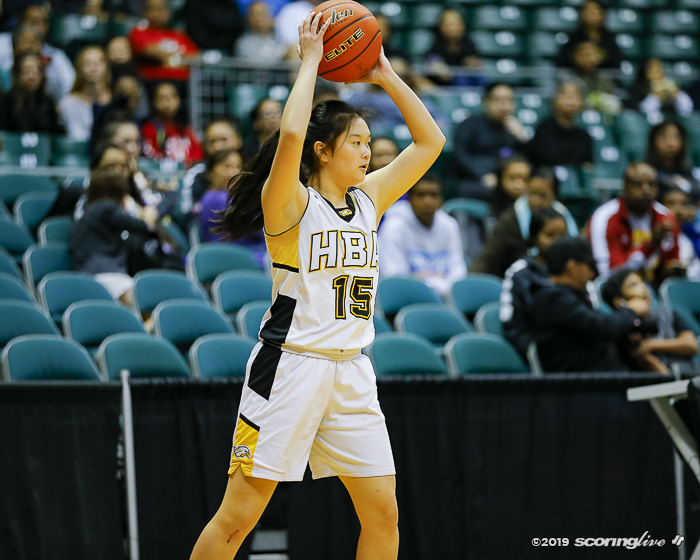 We did great from beginning of the season until now," HBA junior guard Alexis Dang said. 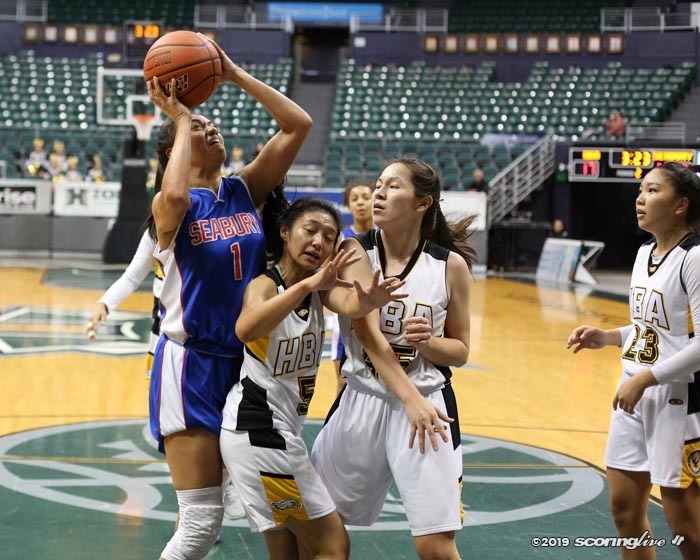 Dang scored a team-high 12 points and had a key steal to close the game. 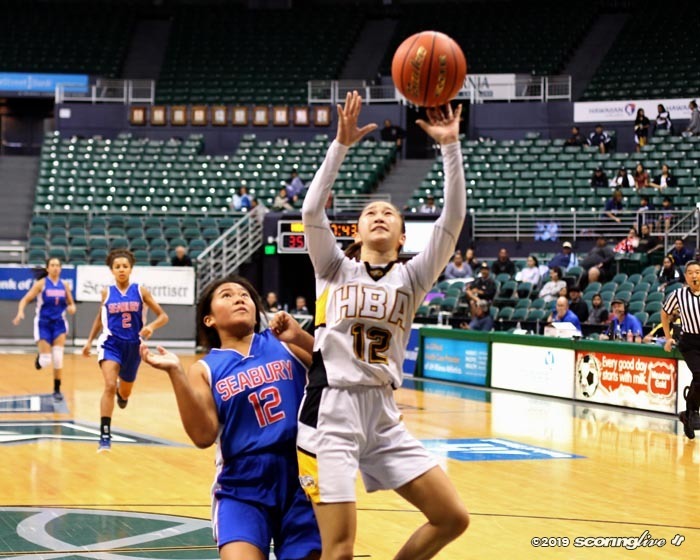 Hayley Taka scored 10, Kyley Nakagawa added nine and Sasha Phillip rounded out the scoring with eight for the Eagles. 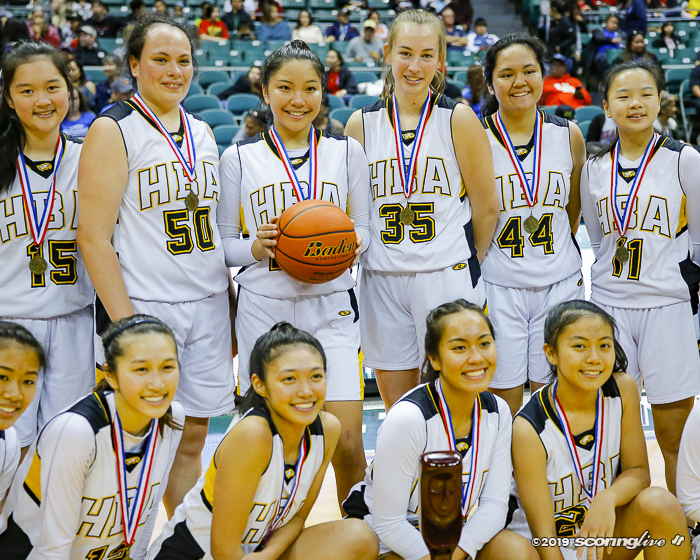 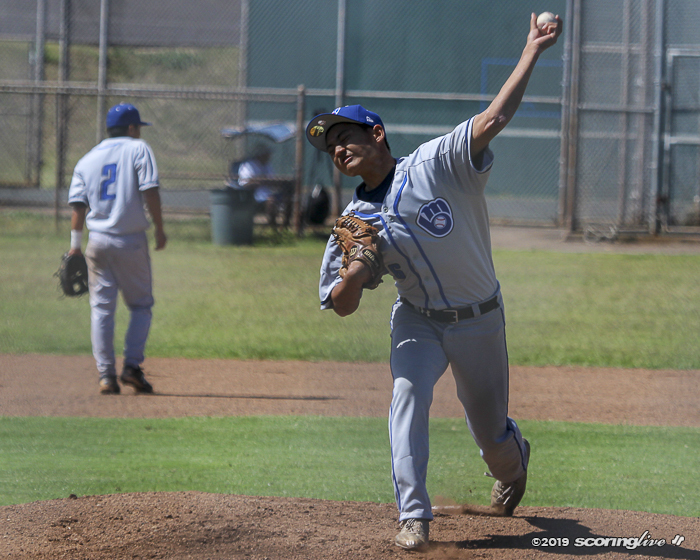 "It's been like that all season, we don't depend on one person to key up on," HBA coach Robin Yamaguchi said. 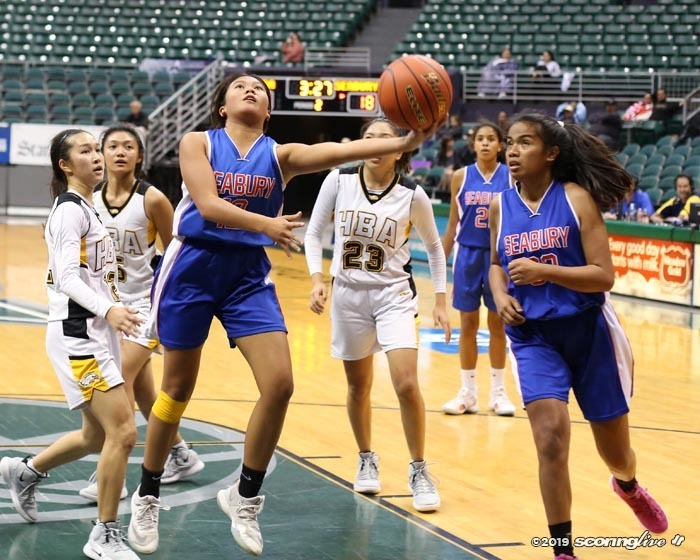 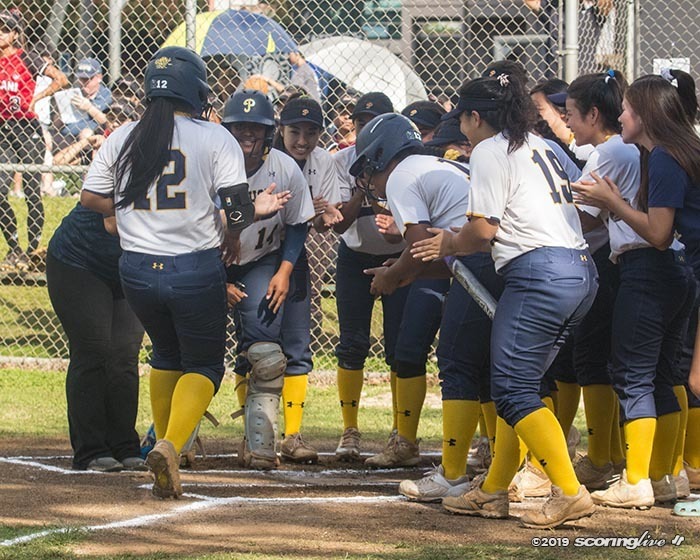 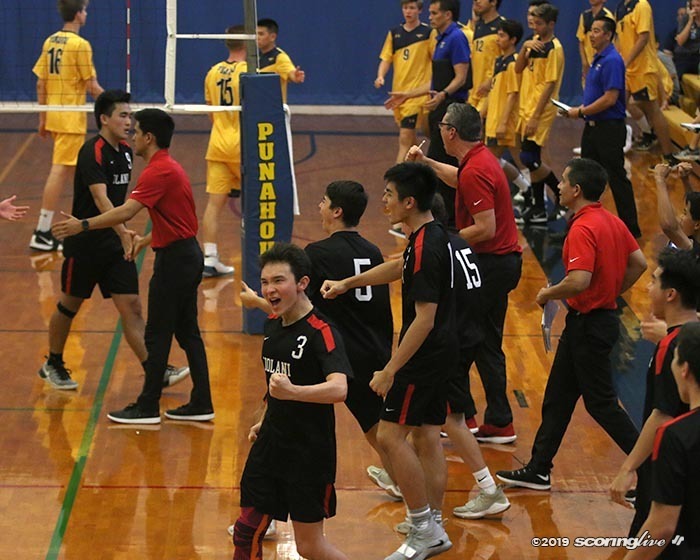 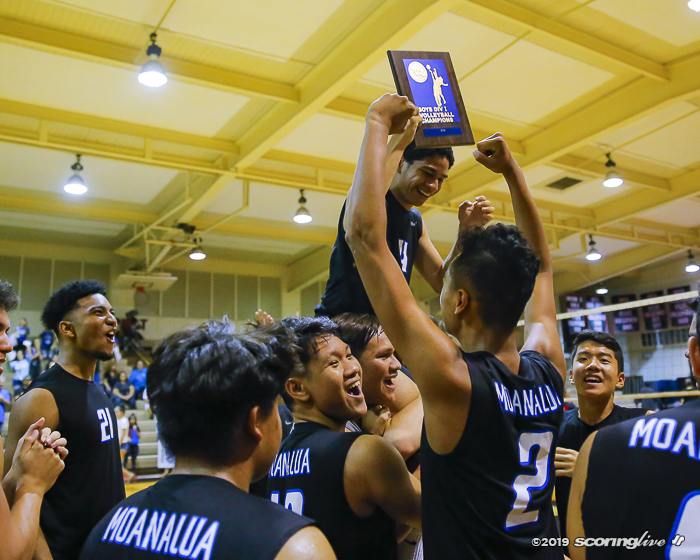 Seabury Hall, who was seeking first-ever title in school history, graduates only one senior and their underclassmen got valuable experience playing on the tournament's biggest stage. 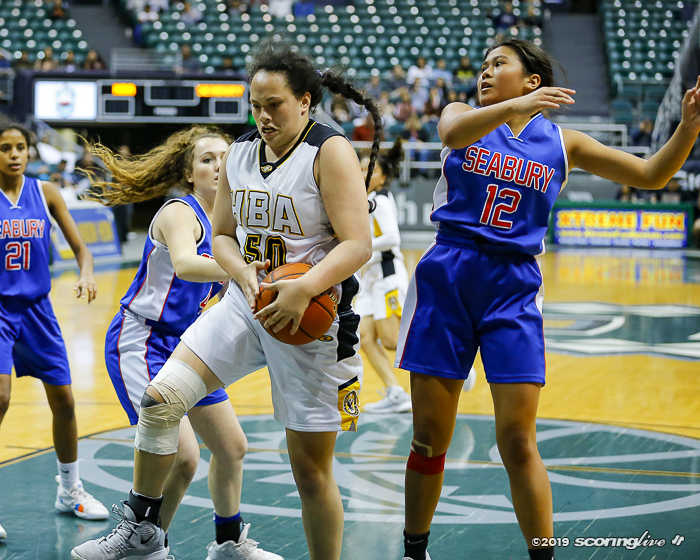 Pio Tuivai (freshman) led the Spartans with 11 points, six boards, three blocks and made three 3-pointers, Birttlay Carillo (freshman) added 10 before fouling out and Anau Tuivai (junior) along with Leela Waterford (freshman) had eight each. 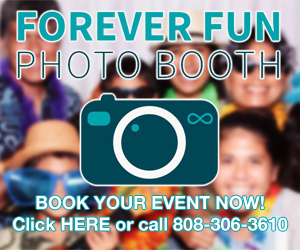 "They grew up fast. 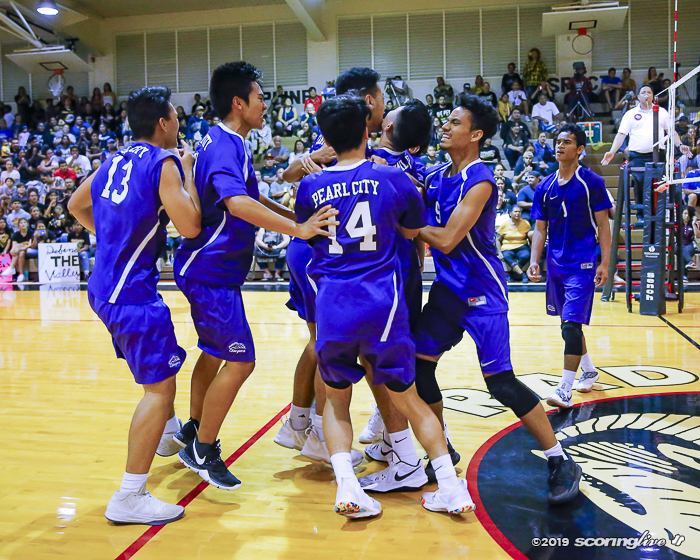 I'm very proud of that," Seabury Hall coach Keone Labuanan said. 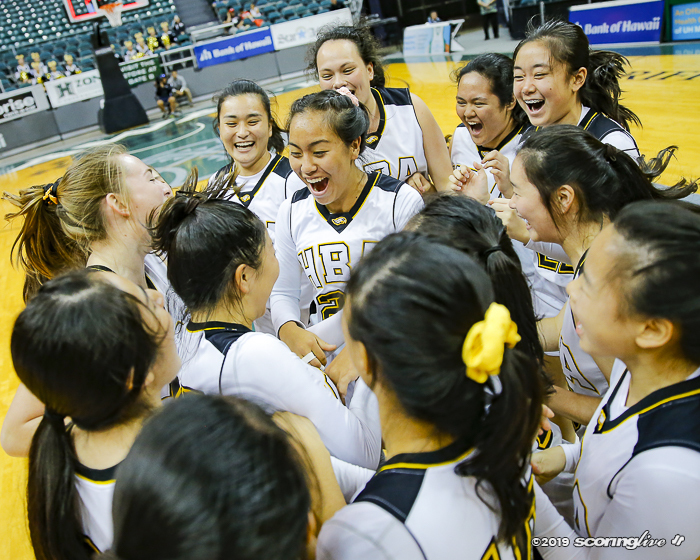 "This is a great confidence builder for them. 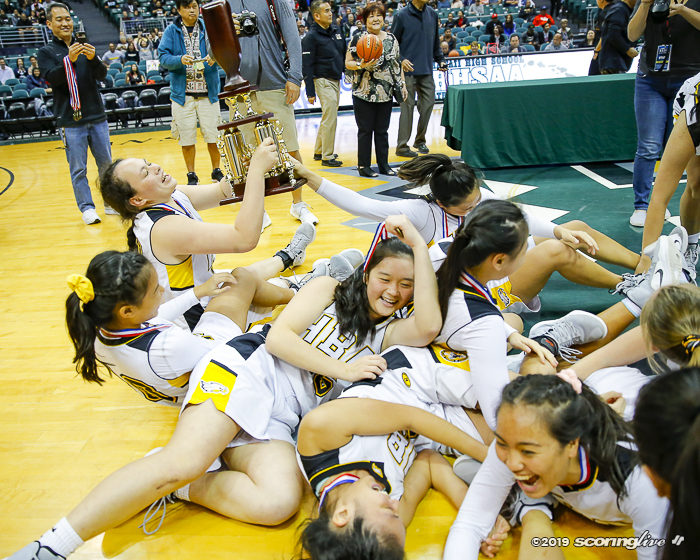 They will have three more years to do this. 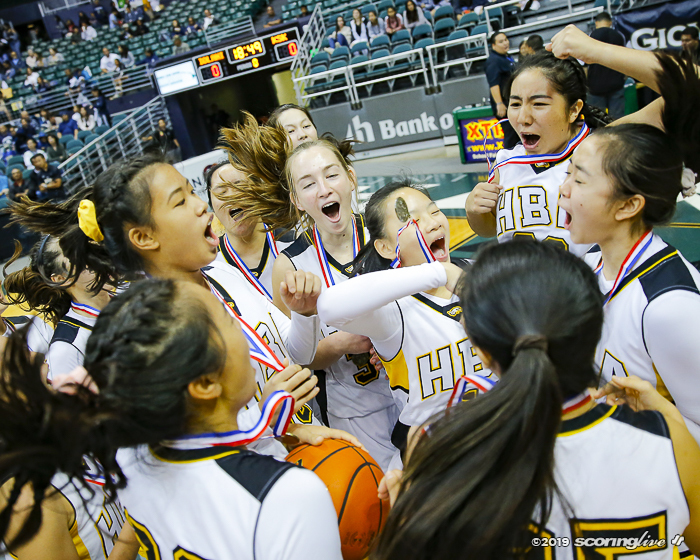 This is big-time motivation for them. 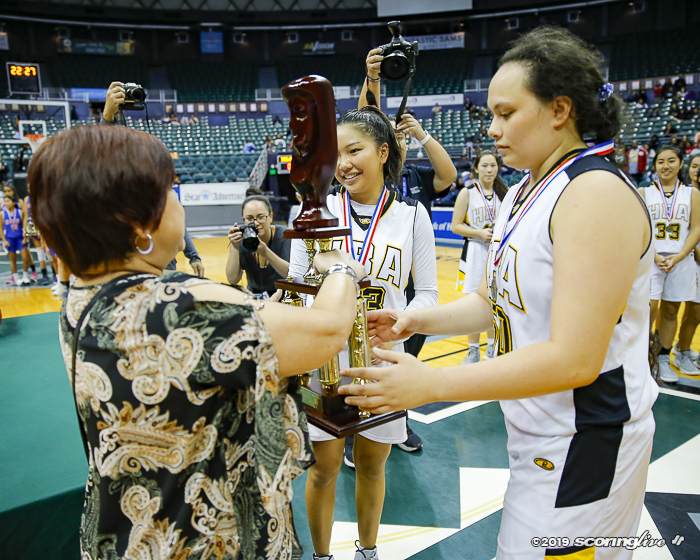 To be a part of it their first year in high school is huge for them." 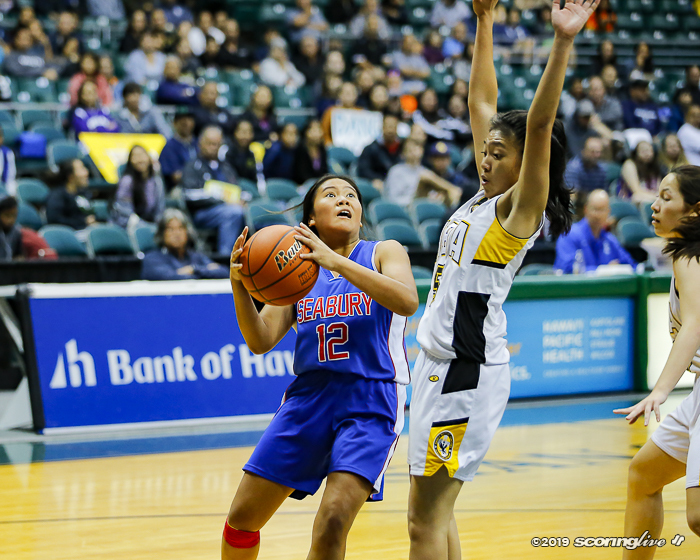 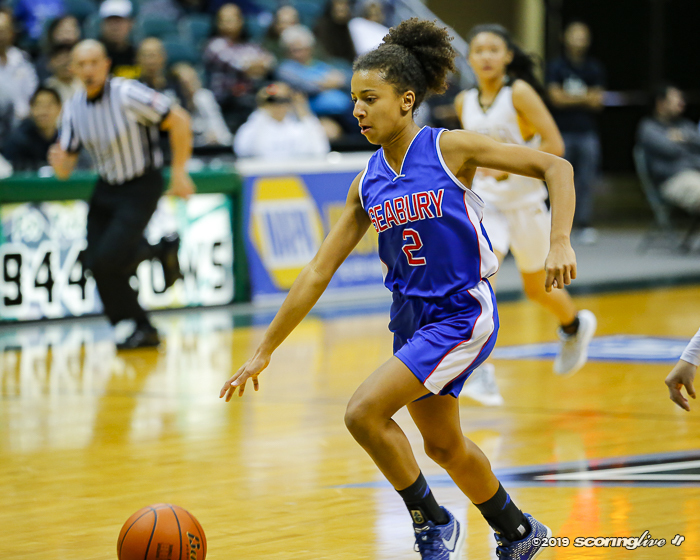 Seabury Hall cut a seven-point deficit all the way down to two after Leela Waterford's putback. 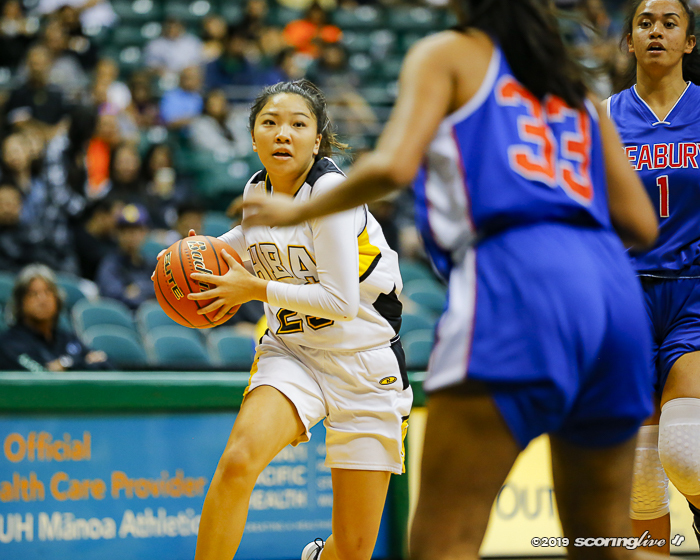 Nakagawa split a pair of double bonus free throws to put the Eagles up three, 42-39, with 39 seconds remaining. 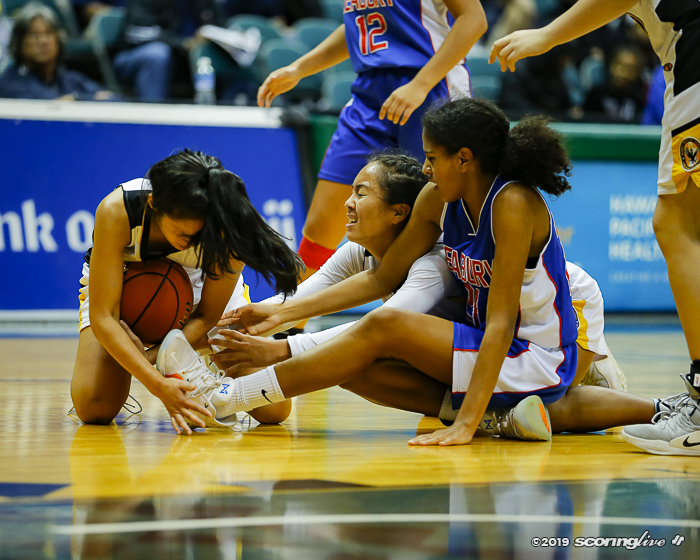 The Spartans got the ball back on the baseline and were looking to get a three-point shot to tie the game, but Dang stole the inbound pass and was fouled. 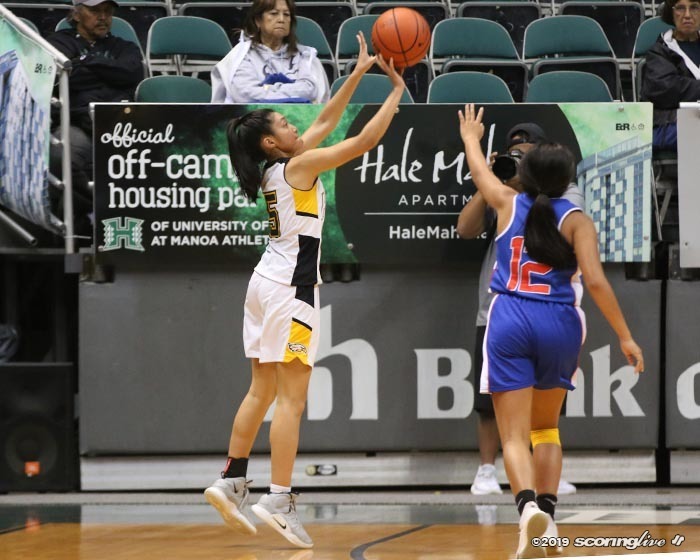 She hit the first free throw to ice the game with 10.2 seconds remaining. 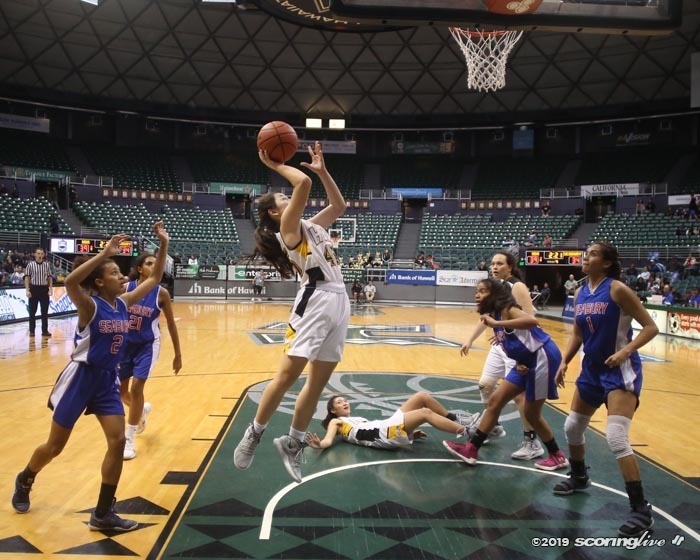 "We were trying to get a 3 in the left corner. 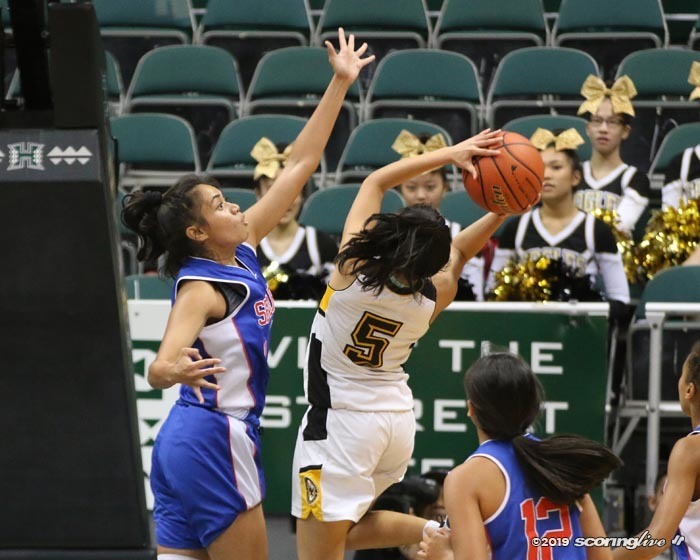 They couldn't get open on this side. 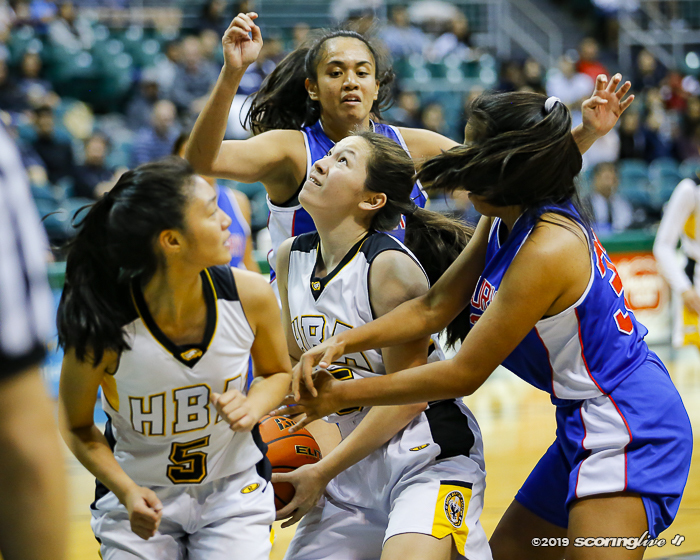 One of our girls forgot to make the down screen and it got messy after that," Lebuanan said of the inbounds play. 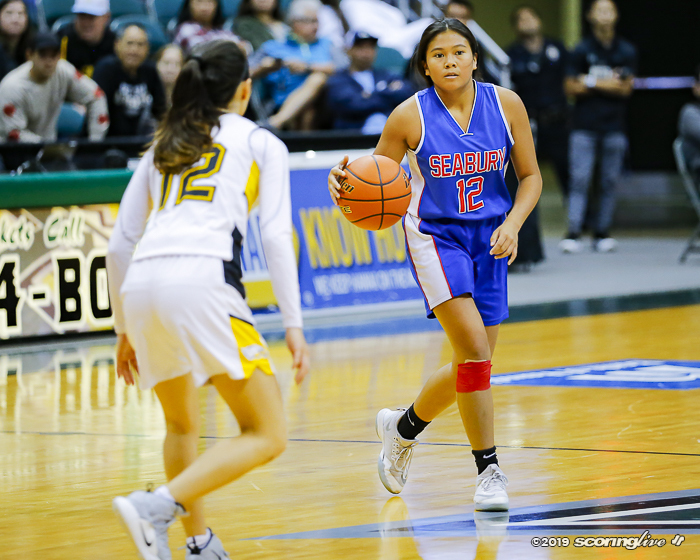 "She was eyeing down the pass, so I did what I had to do and got the steal," Dang said of the clinching play. 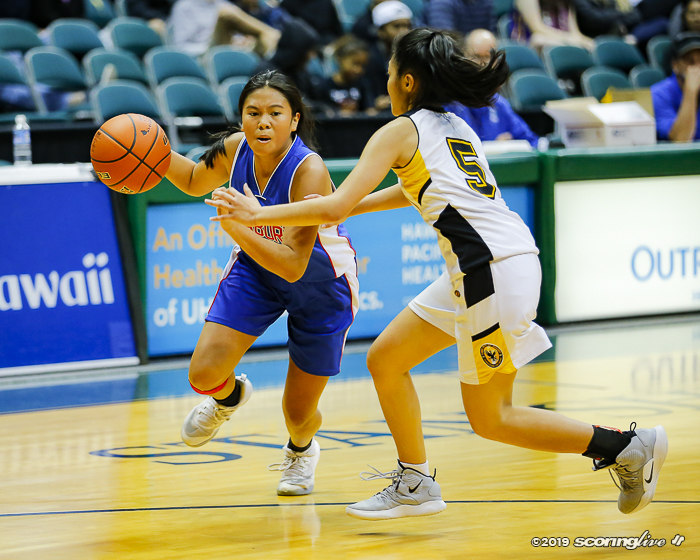 The Eagles raced out to a 12-4 lead in the first quarter, but the Spartans roared back with a 10-0 run to close the quarter. 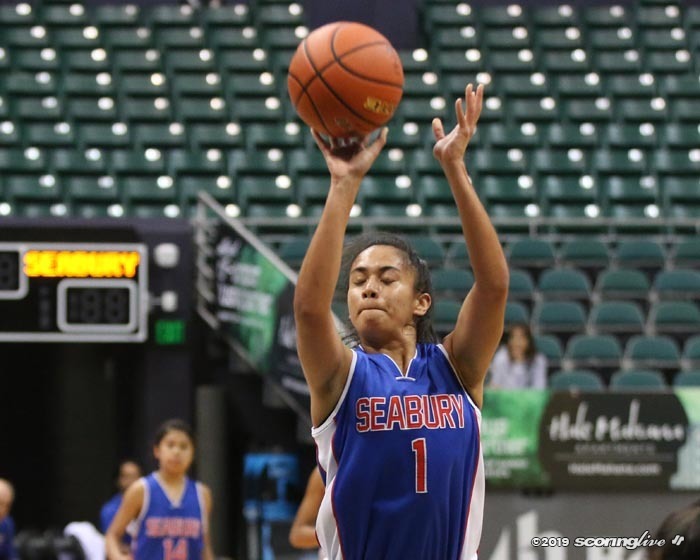 Carillo and Pio Tuivai each hit 3-pointers, Carillo added a layup and Anau Tuivai was perfect from the free-throw line as Seabury Hall took a 14-12 lead going into the second. 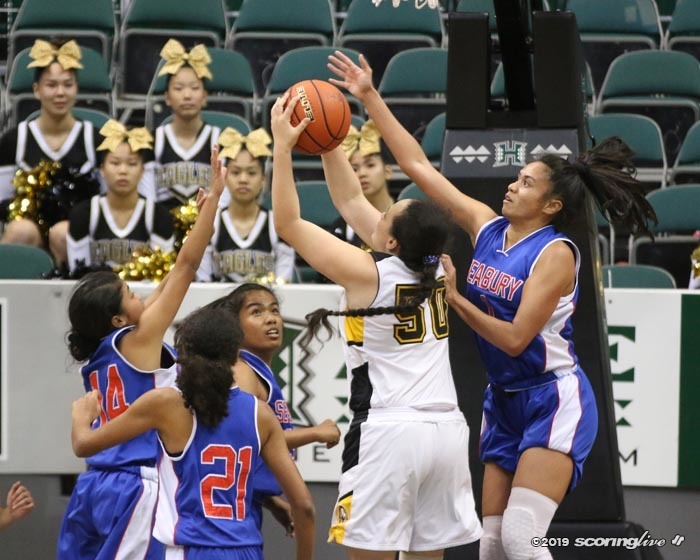 "I had a feeling it would be a tough first quarter. 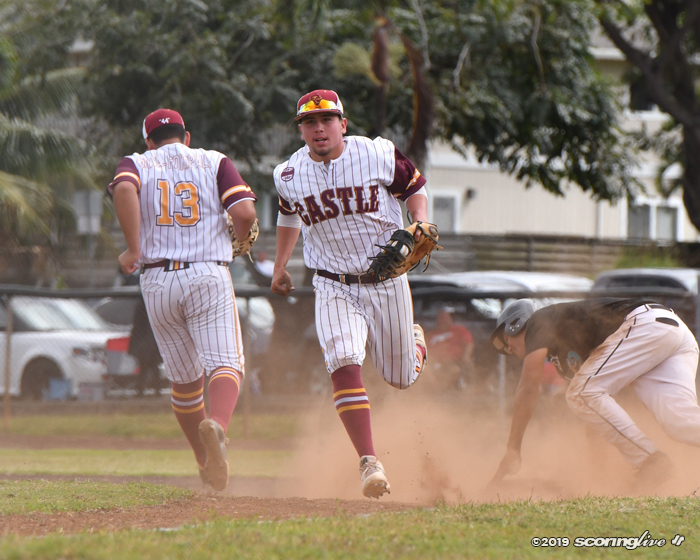 It showed the maturity," said Labuanan of the slow start and the rally. 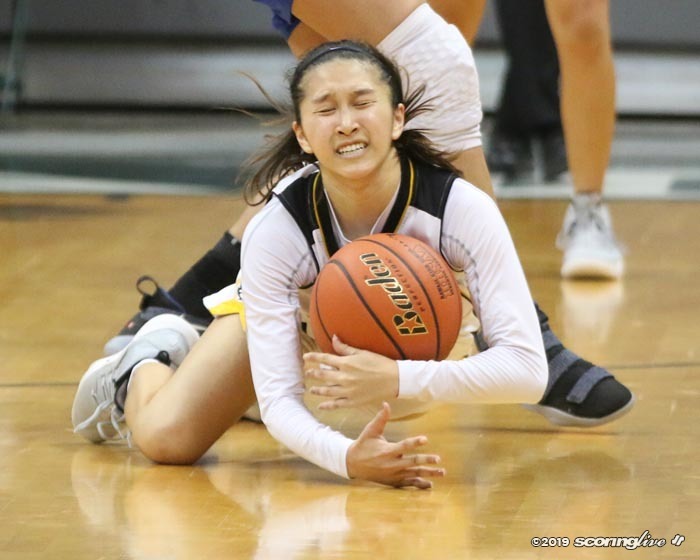 Dang swished a 3-pointer to start the second quarter for a 17-14 lead. 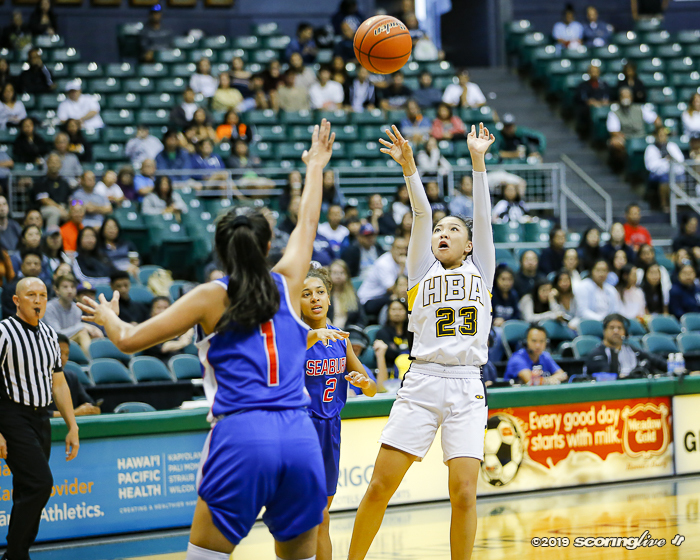 Ameera Waterford hit a bank shot and Leela Waterford made a pair of free throws for a 18-17 lead. 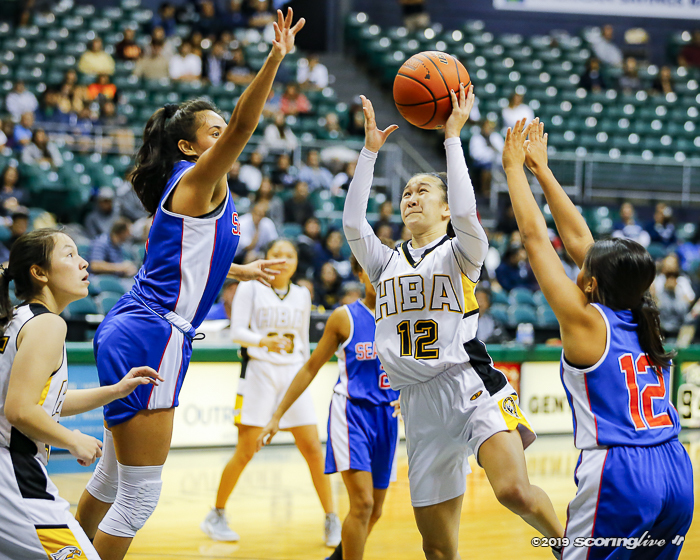 The Spartans and Eagles traded leads before Nakagawa's runner in the lane gave HBA a 21-20 lead at halftime. 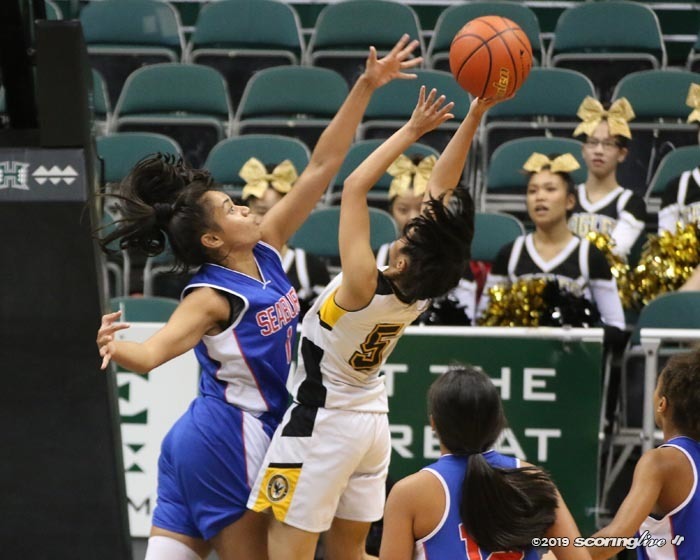 "It was a very close game. 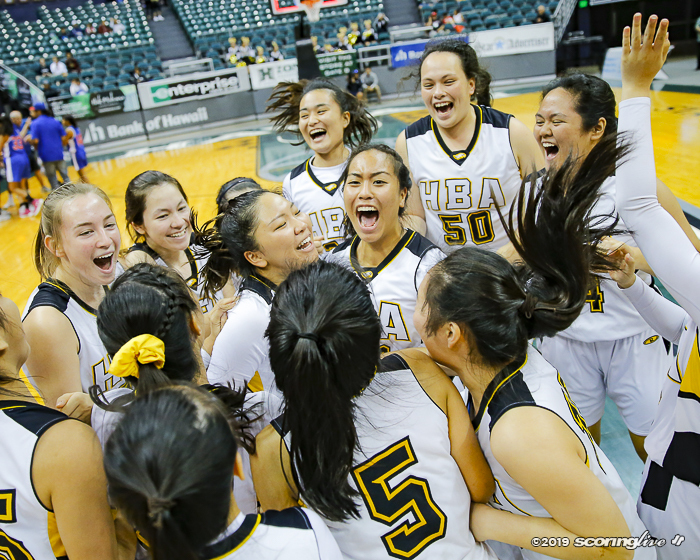 They (HBA) are a very disciplined team. 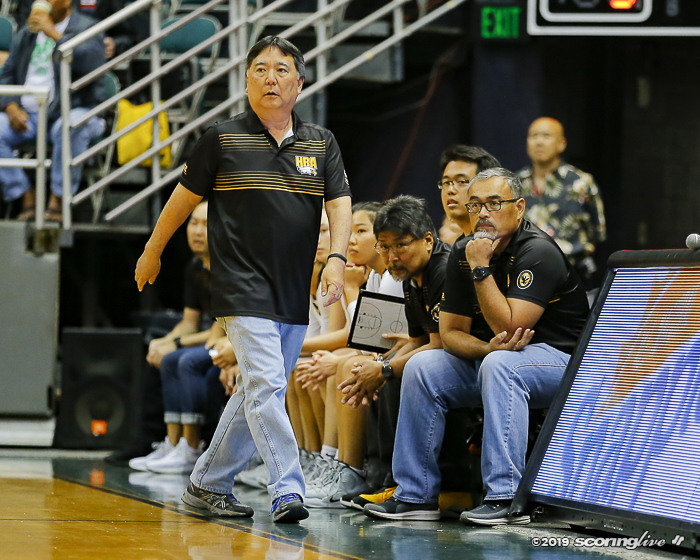 They didn't turn over the ball in the halfcourt which I watched last night," Labuanan said. 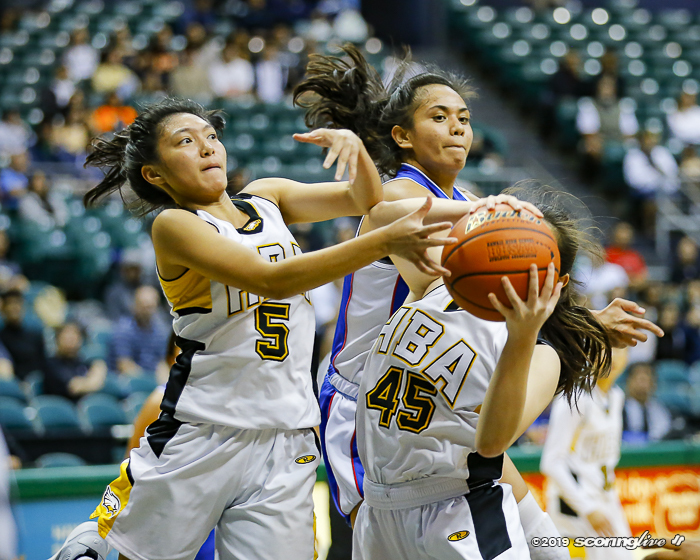 "We just had to clean up a few rebounding issues, but other than that, our girls played great." 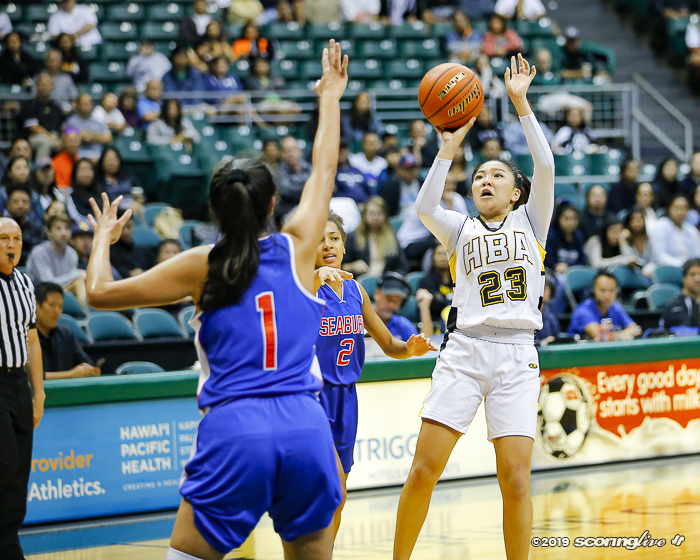 Phillip accounted for a 6-0 run all by herself to open up the third to put HBA up seven, 27-20. 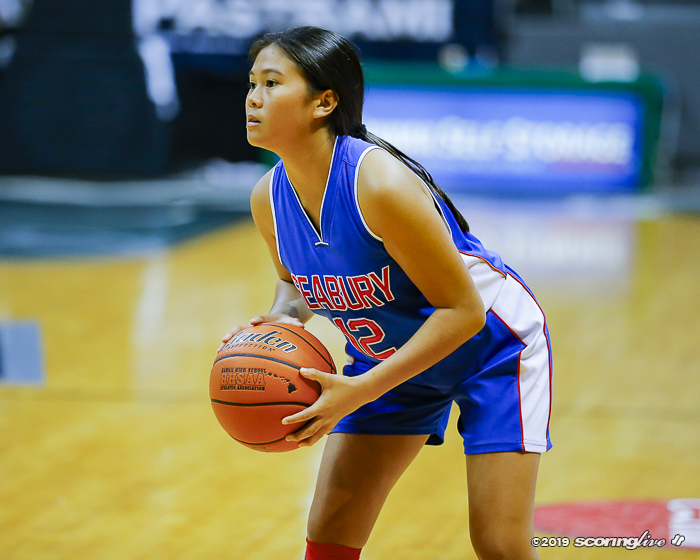 Pio Tuivai hit a 3-pointer earlier in the quarter and hit another as Seabury Hall trailed, 31-28. 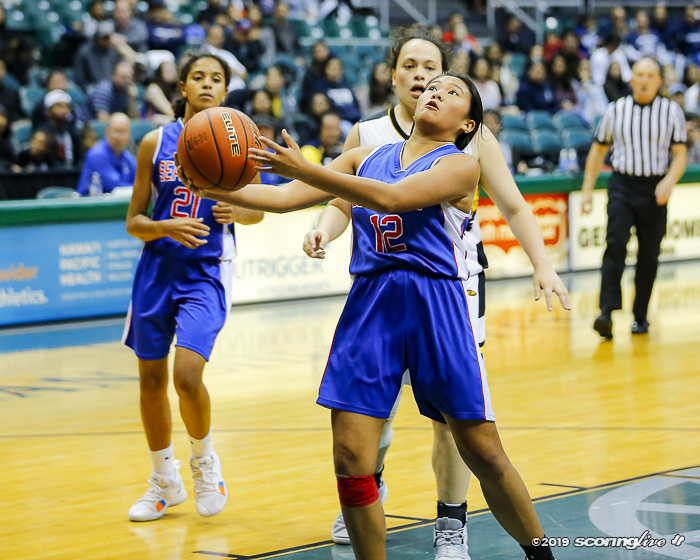 Carillo found Leela Waterford as the Spartans trailed by one, but Dang hit a shot before the horn to put the Eagles up three, 35-32. 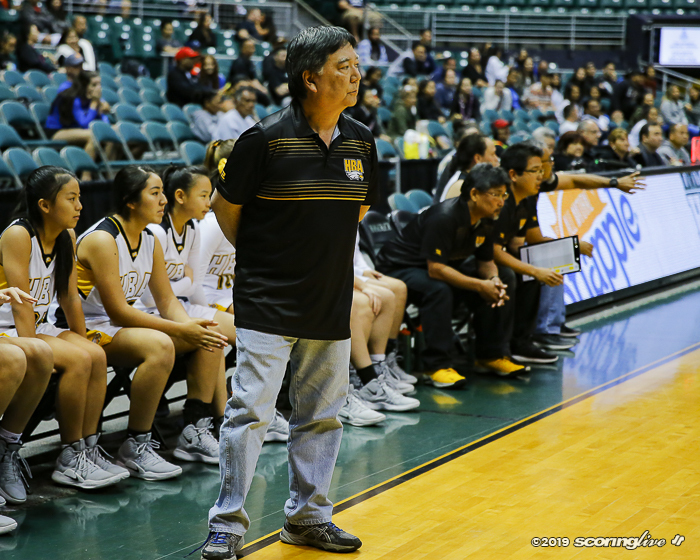 "I thought they were going to give us a hard time," Yamaguchi said. 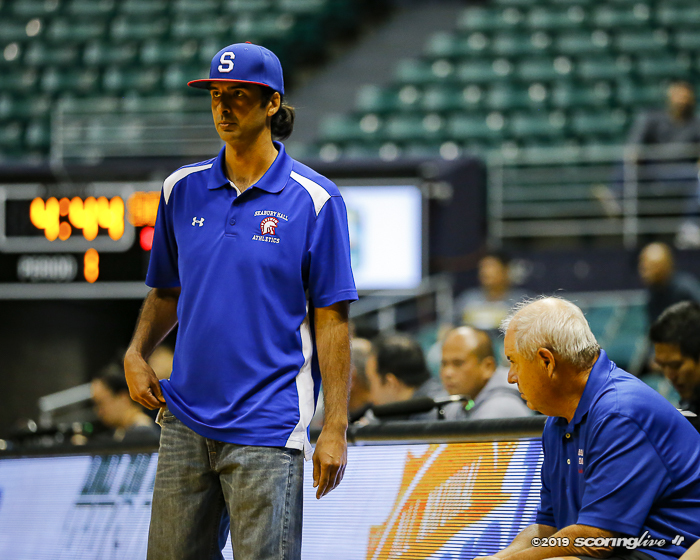 "I knew they were going to come back. 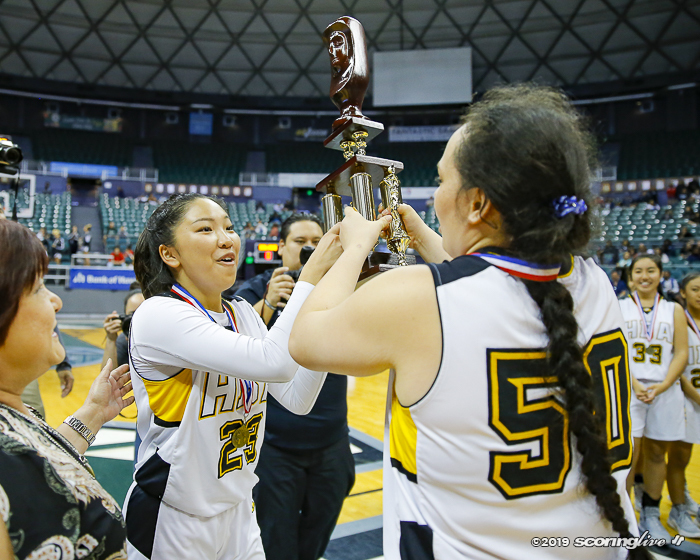 We still had to think what we're going to do." 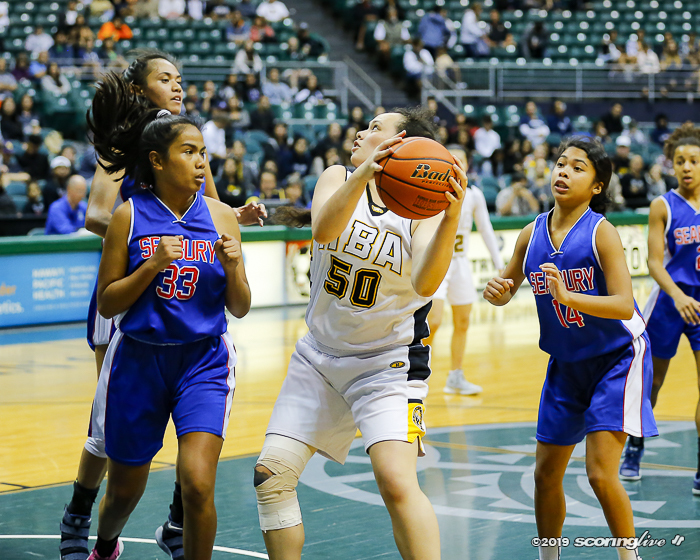 Seabury Hall trailed by three following Anau Tuivai's jumper, but HBA went up seven after Taka's baseline jumper. 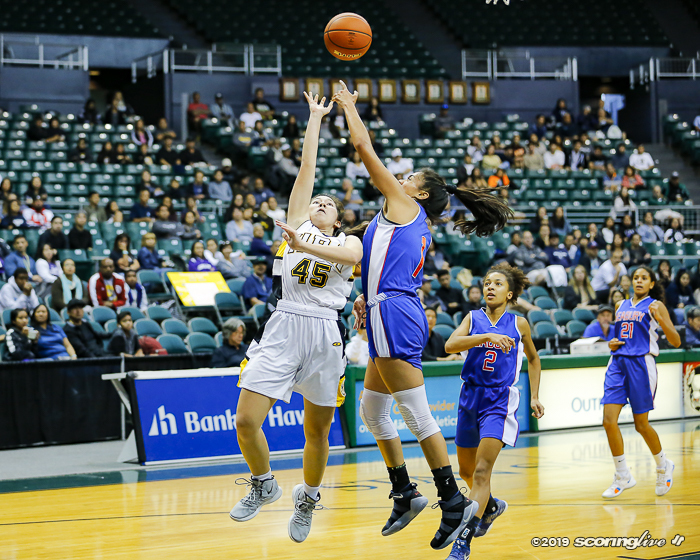 The Spartans whittled the deficit with a 5-0 run after Carillo convereted an and-one and Leela Waterford's jumper gave themselves an opportunity to tie the game.